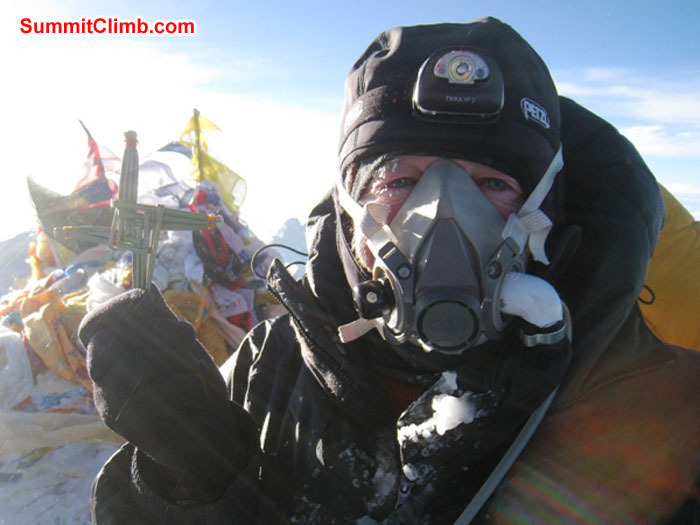 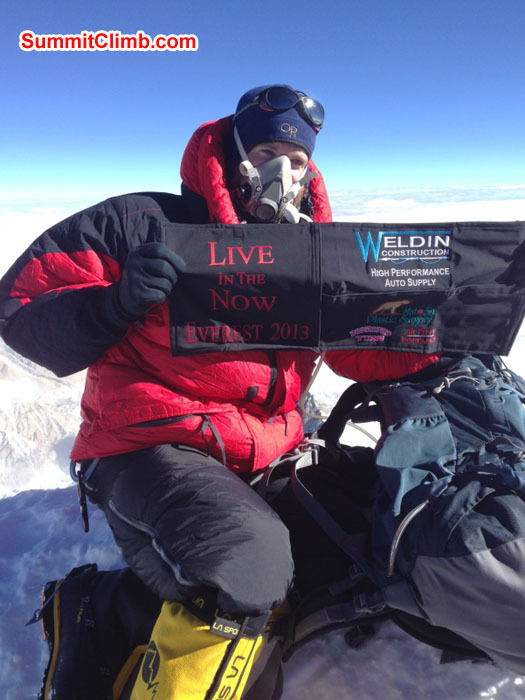 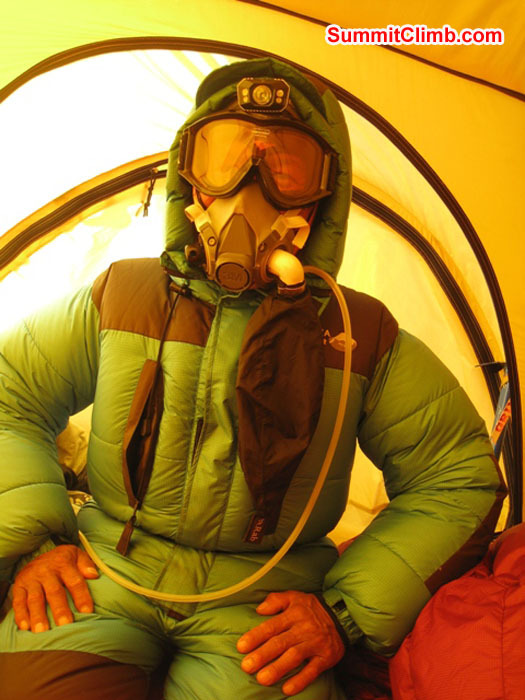 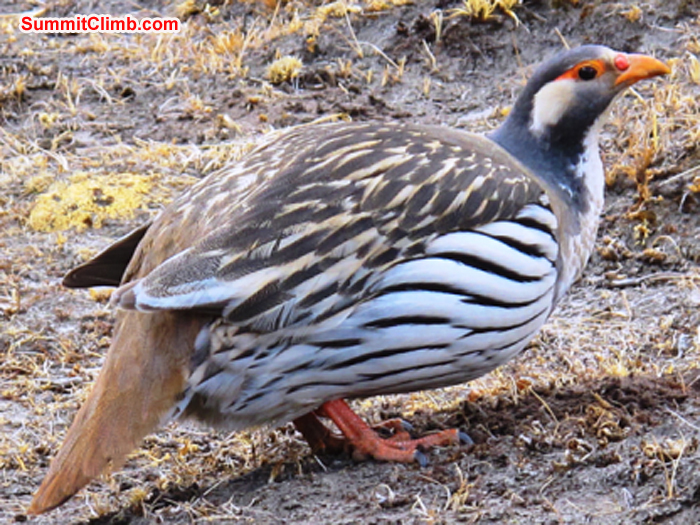 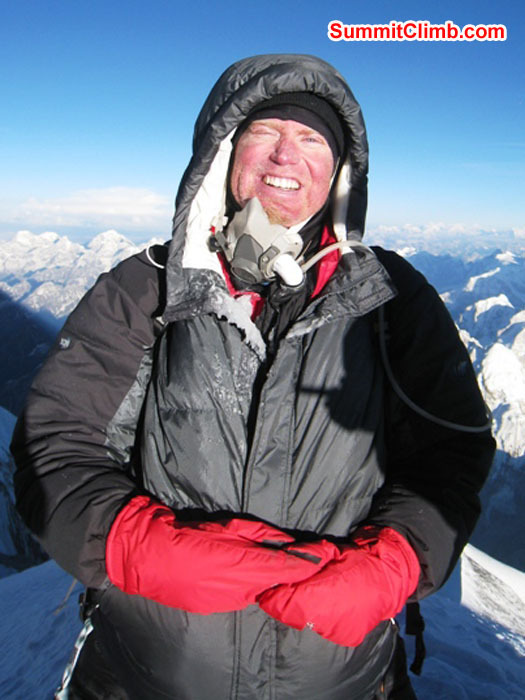 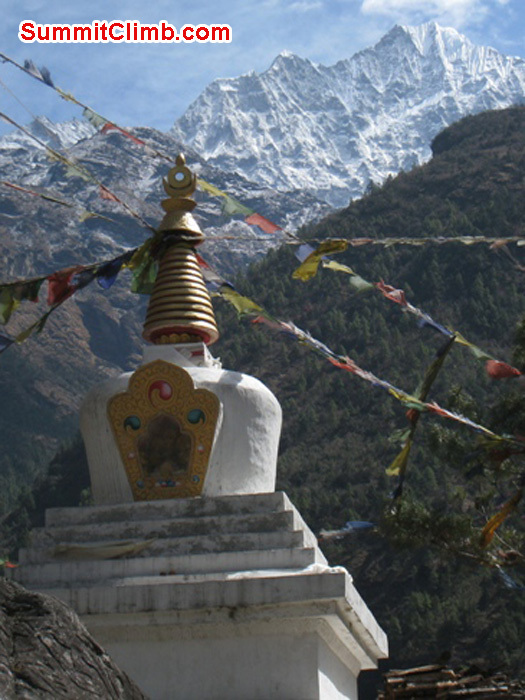 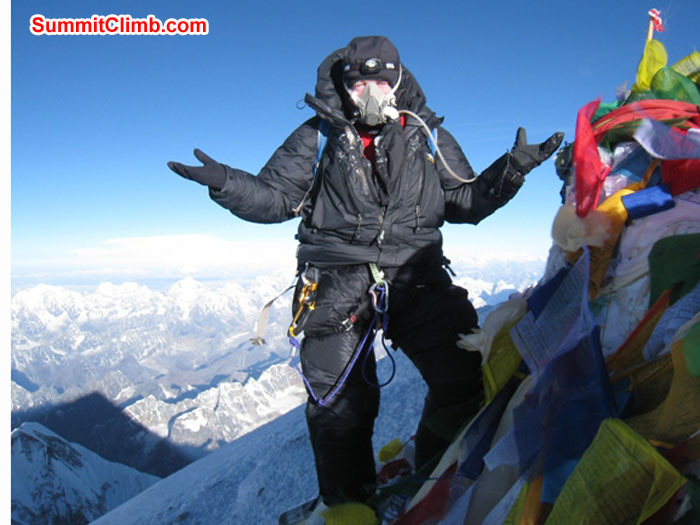 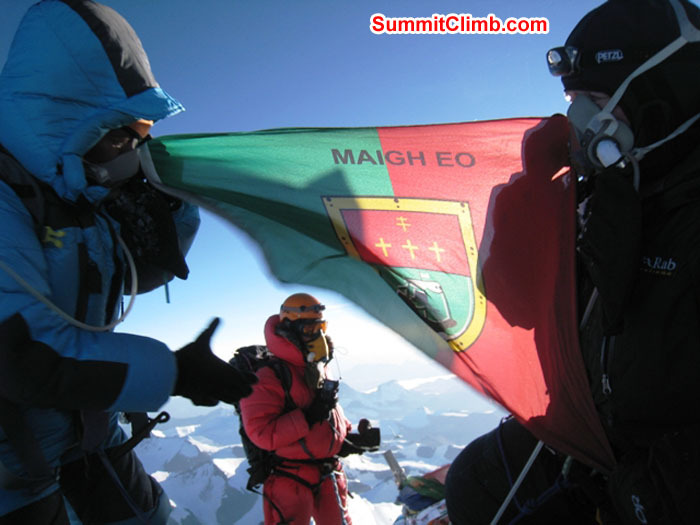 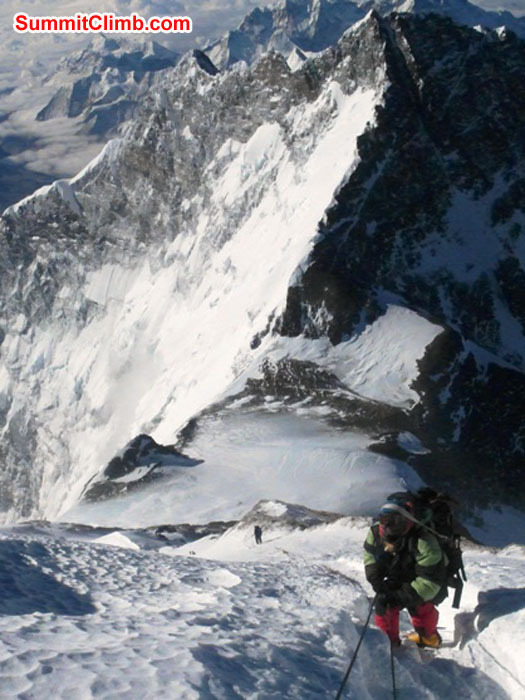 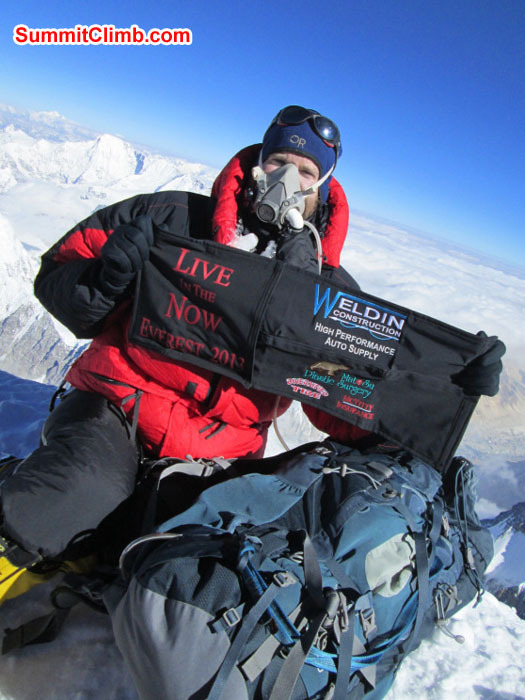 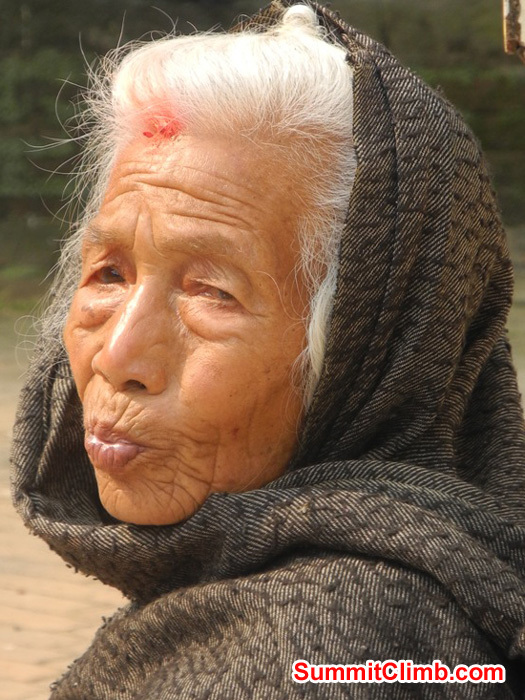 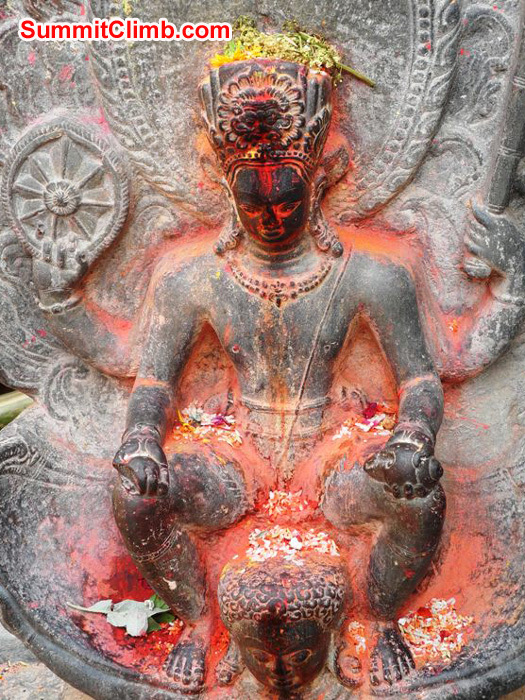 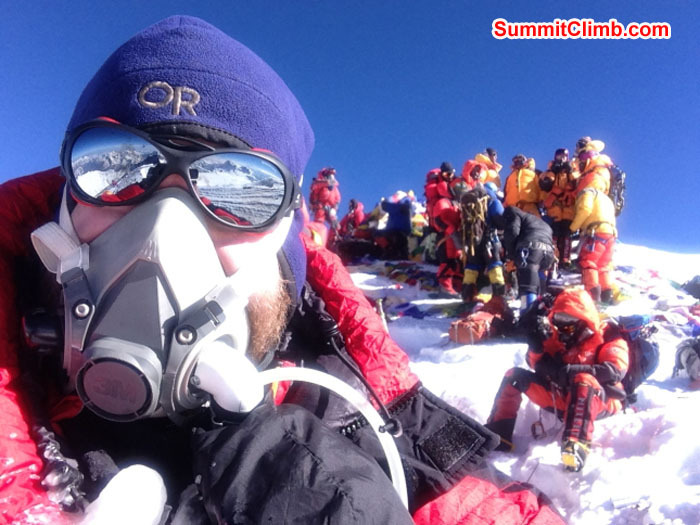 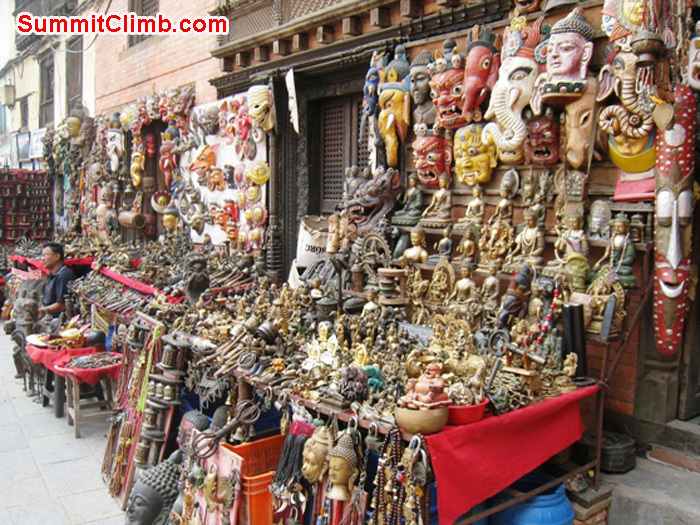 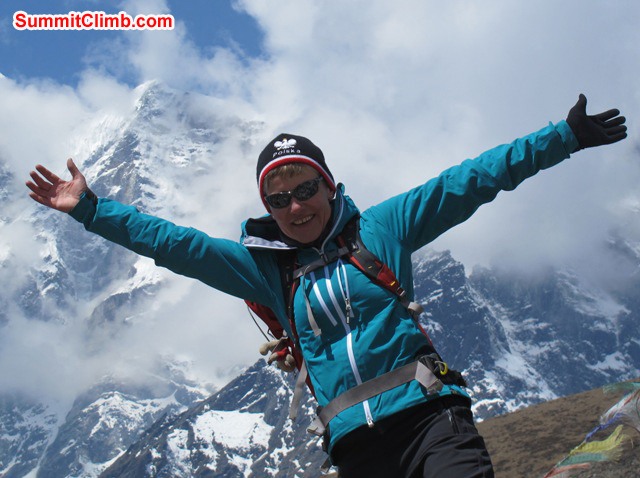 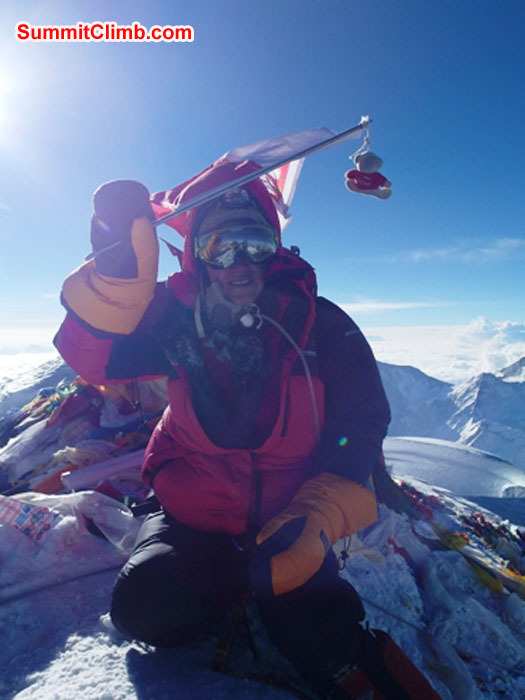 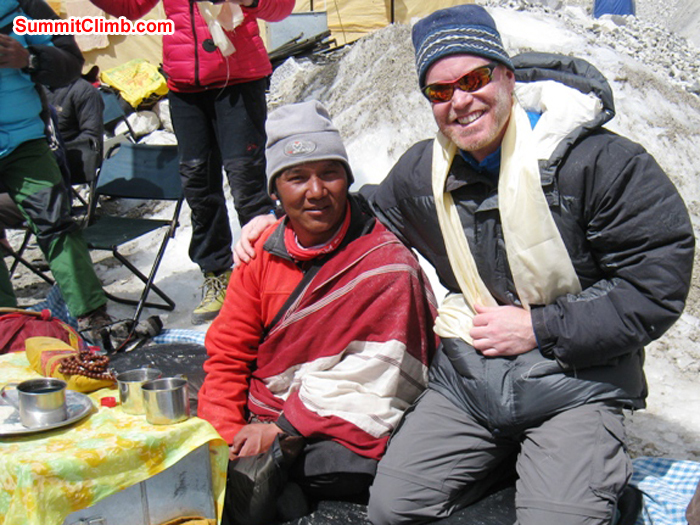 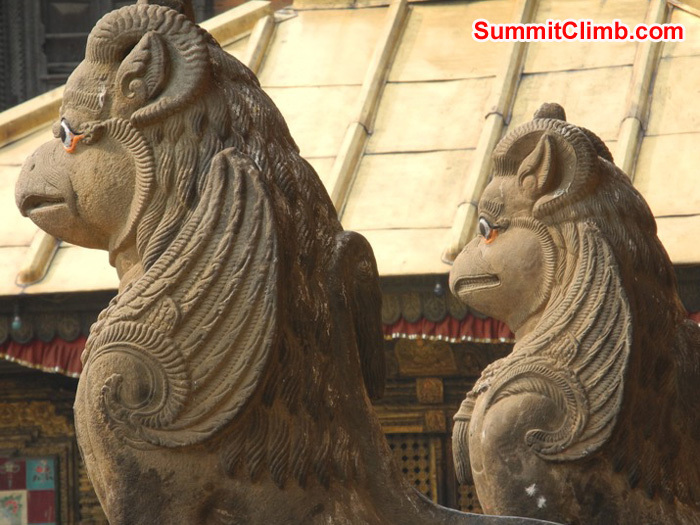 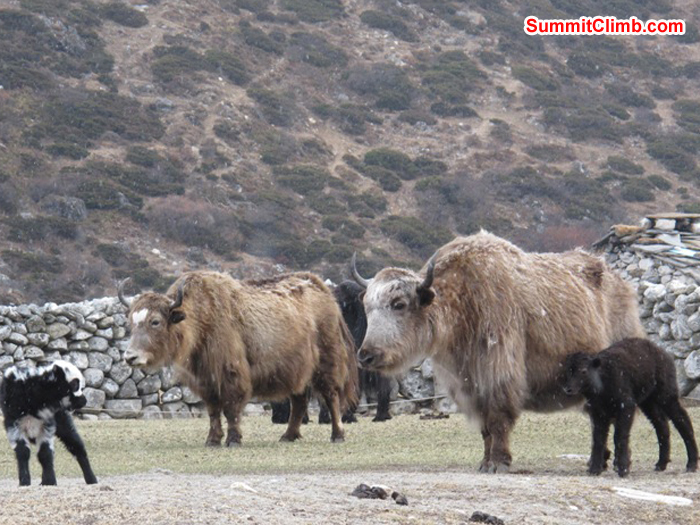 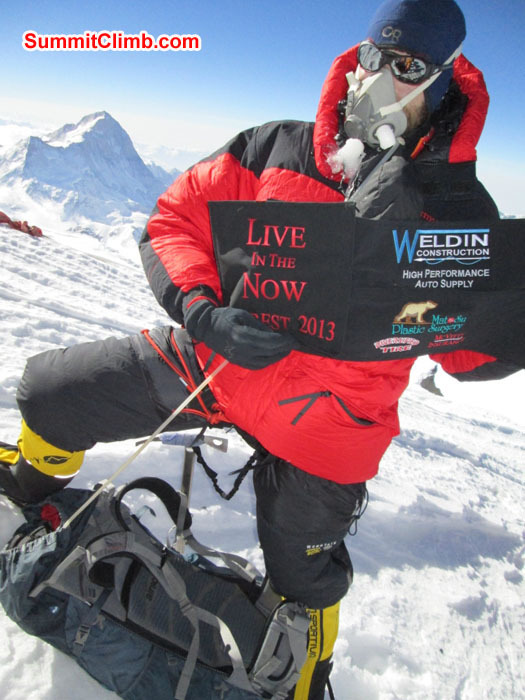 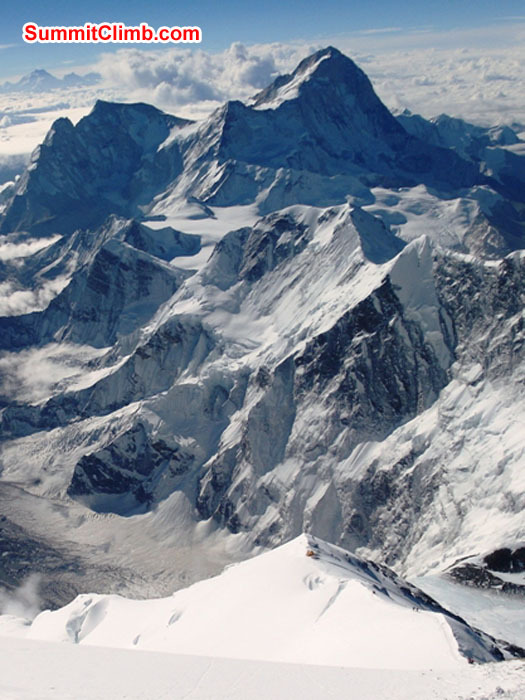 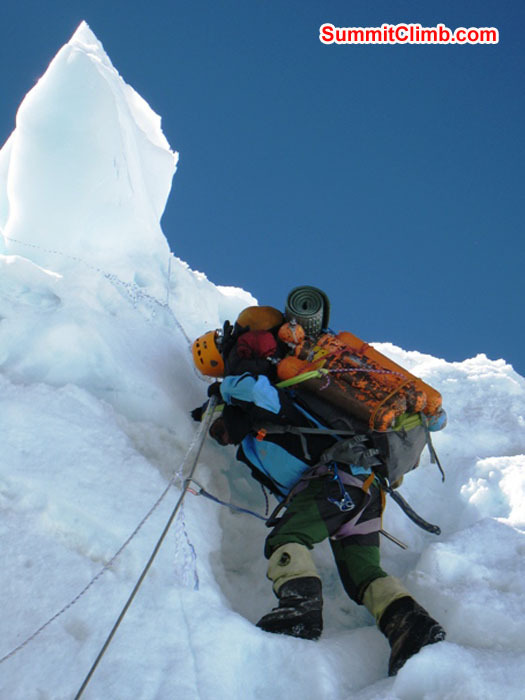 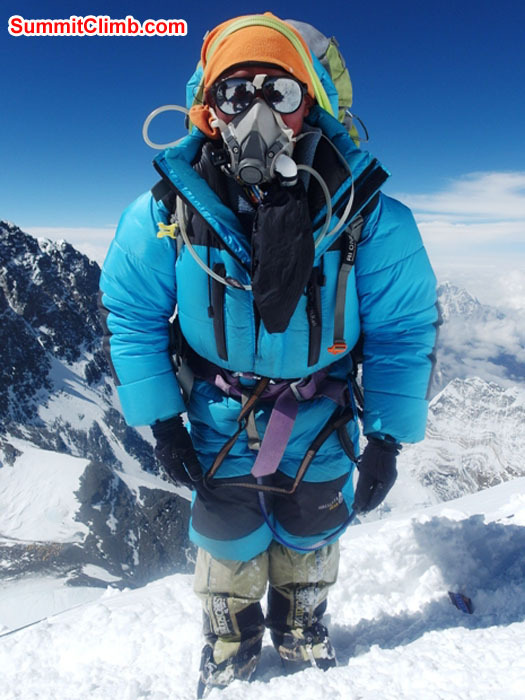 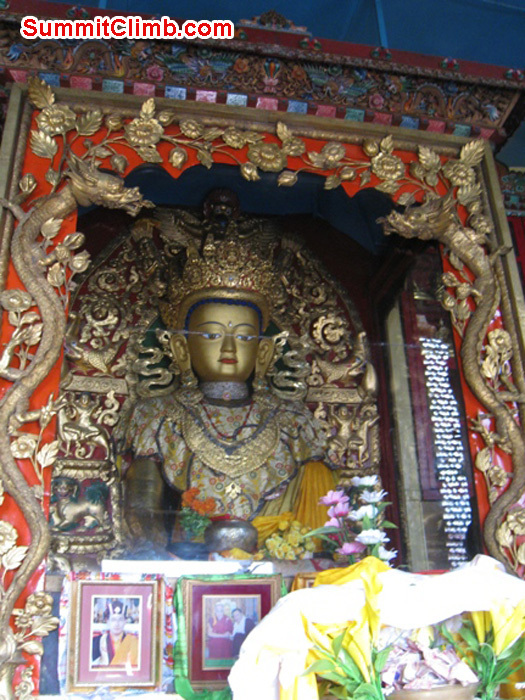 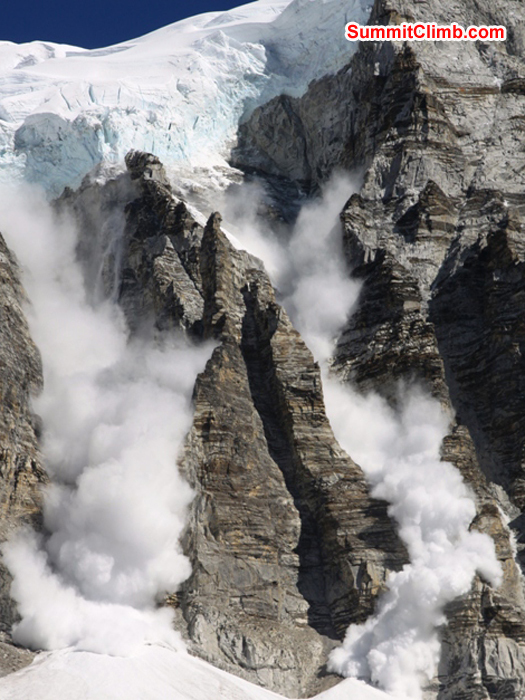 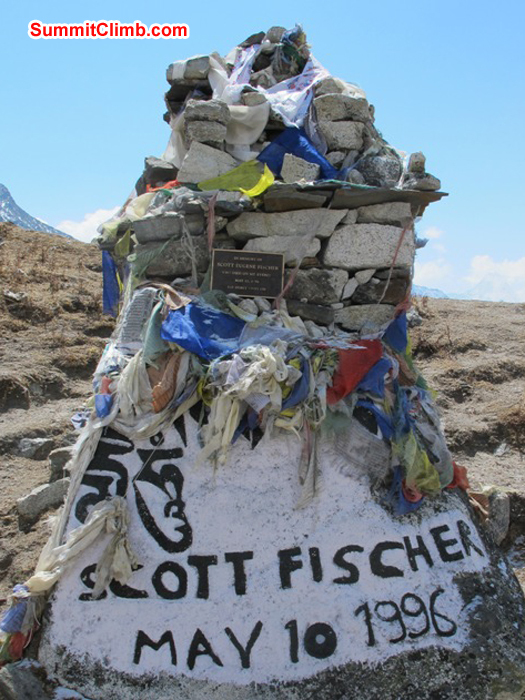 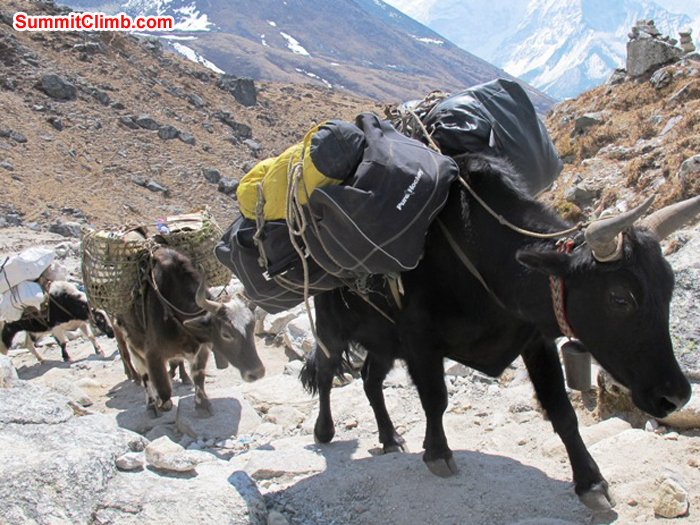 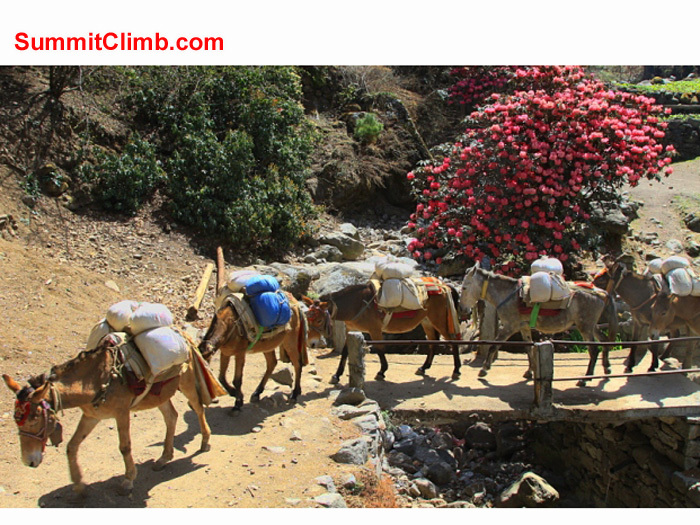 View our links for more information about our Everest Nepal, Lhotse and Everest Training Climb expeditions, as well as Everest Basecamp Trek . 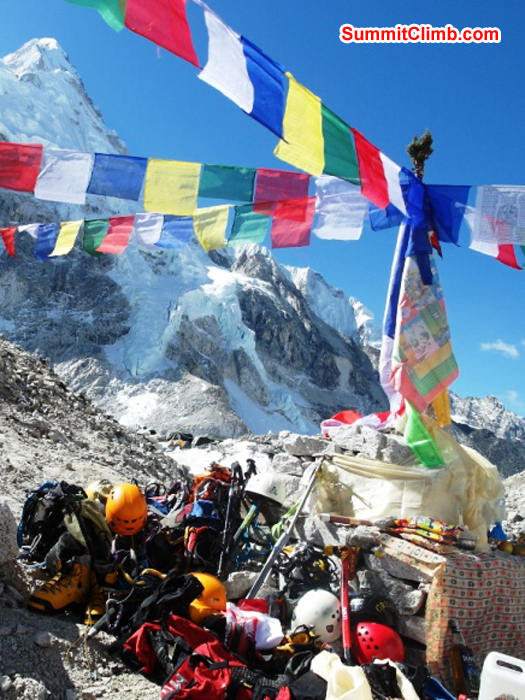 We are now accepting applications for Spring 2016, so please join us for Everest, Lhotse, Cho Oyu and our treks and trekking peaks. 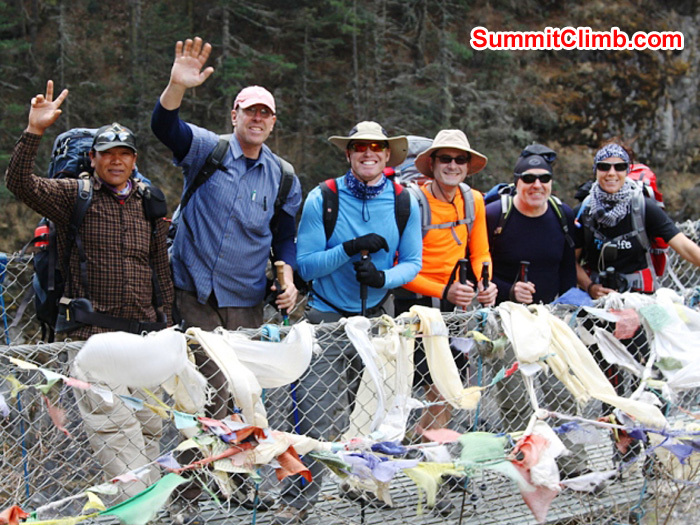 Welcome to the news of the Camp 3 Everest Training Climb where a group of people from around the world, some of whom knew each other from before and many of whom were new friends, came to Nepal to trek to basecamp and even to climb up to Everest's camp 3, which happens to lie at 7000 metres / 23,000 feet above sea level. 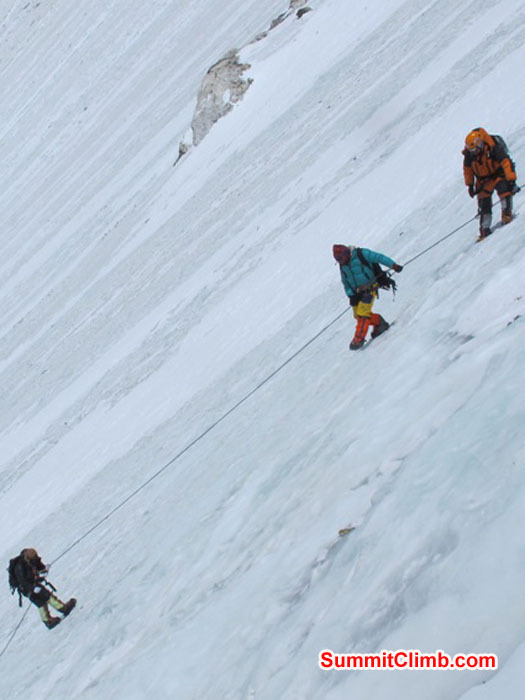 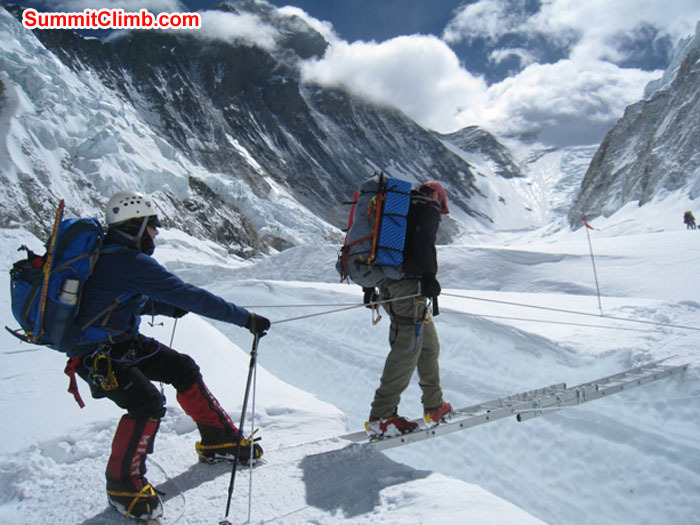 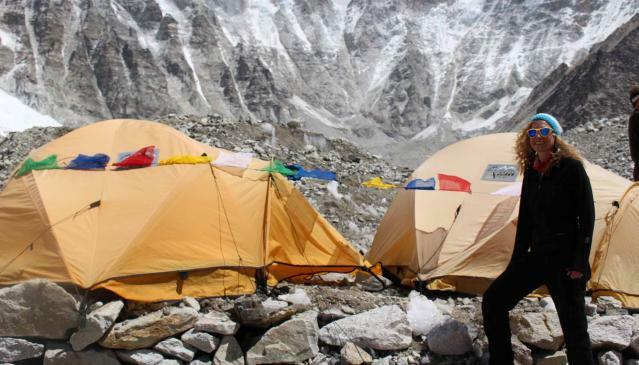 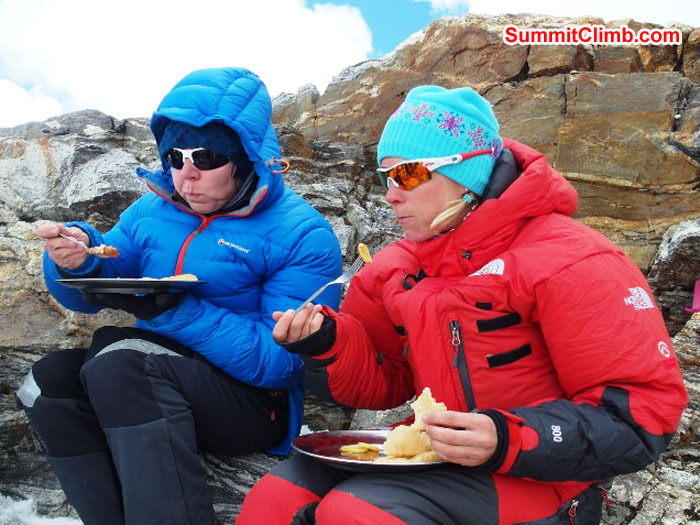 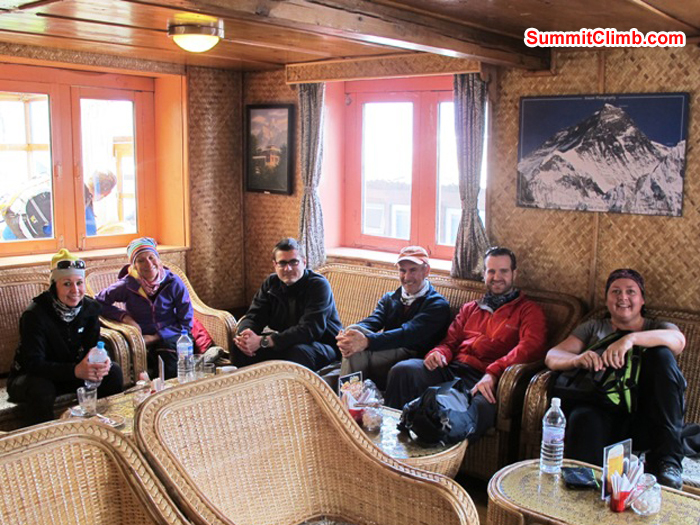 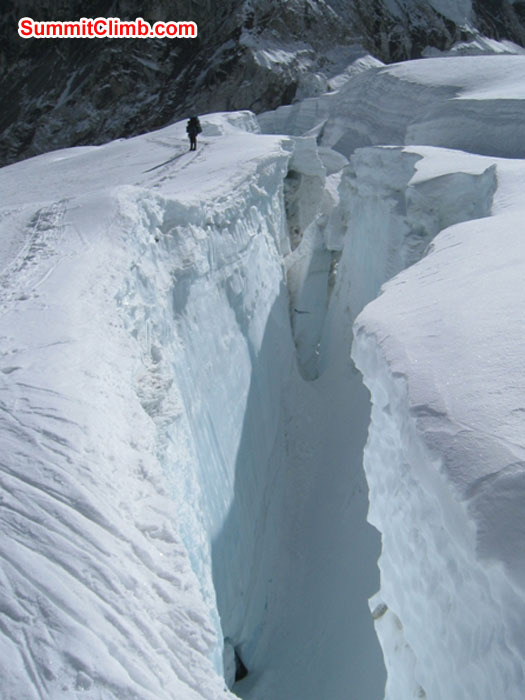 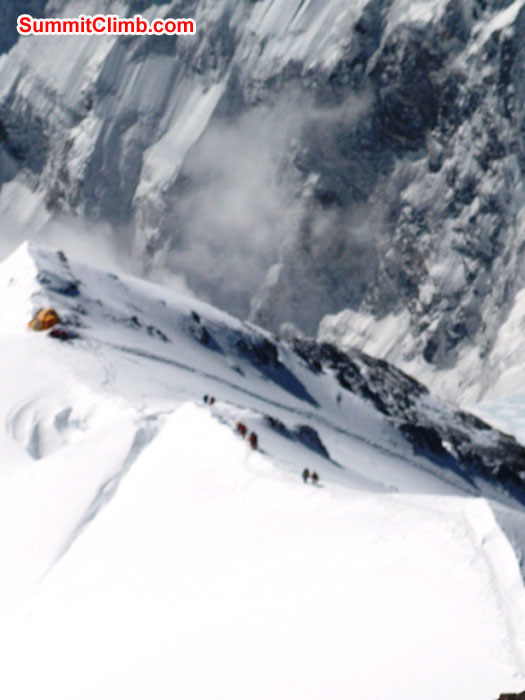 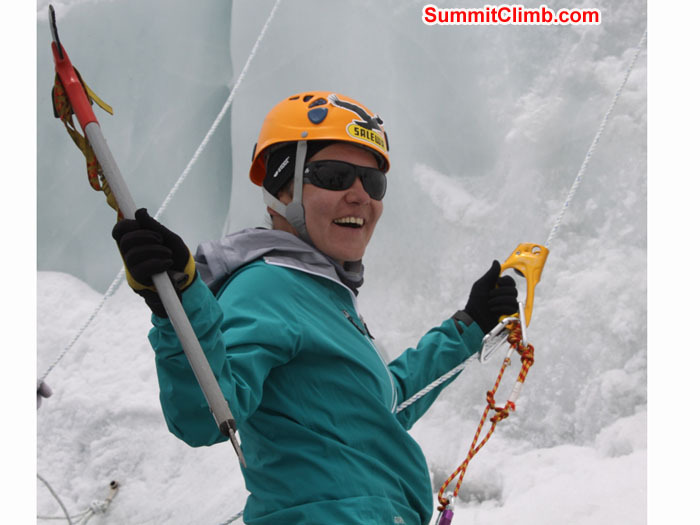 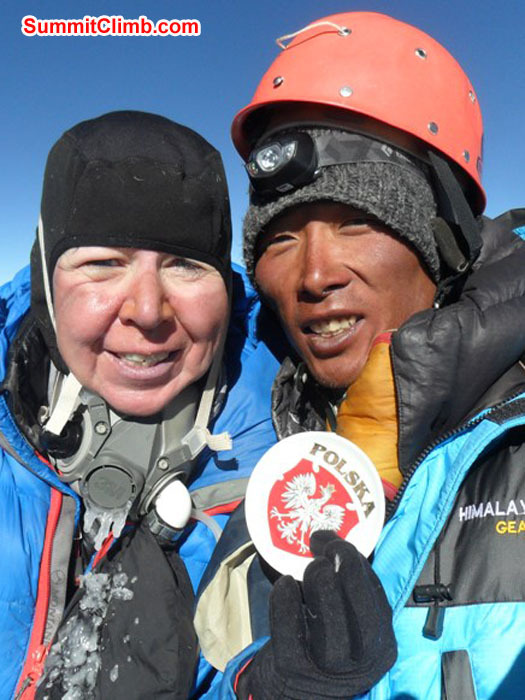 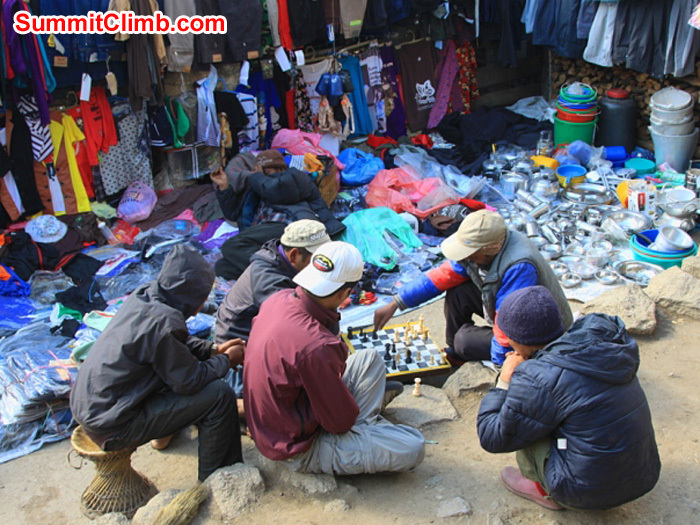 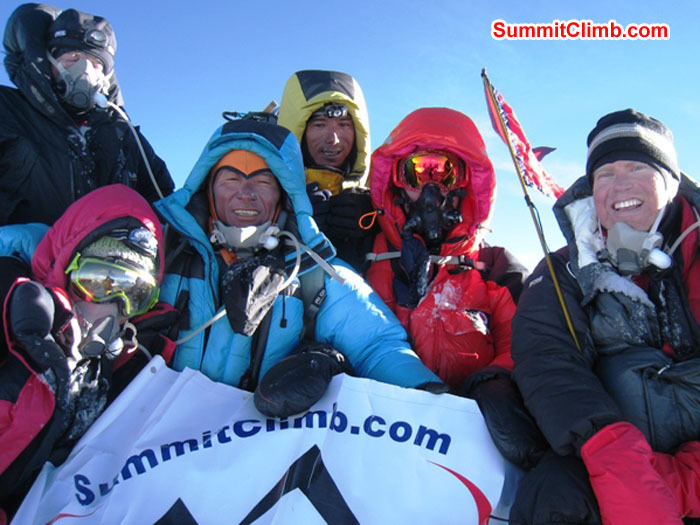 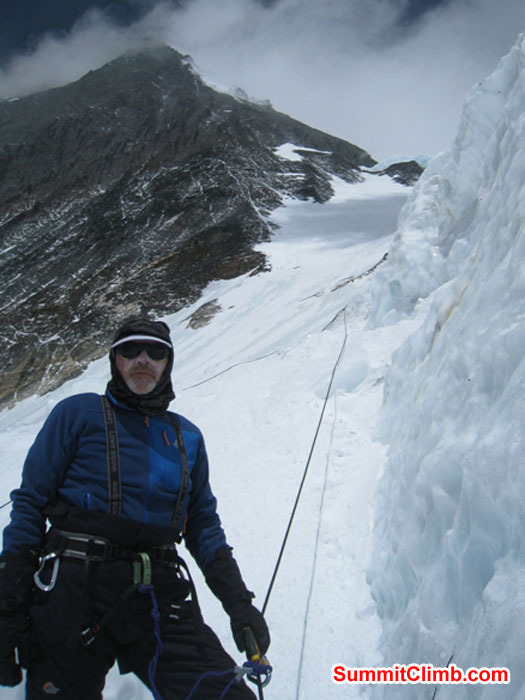 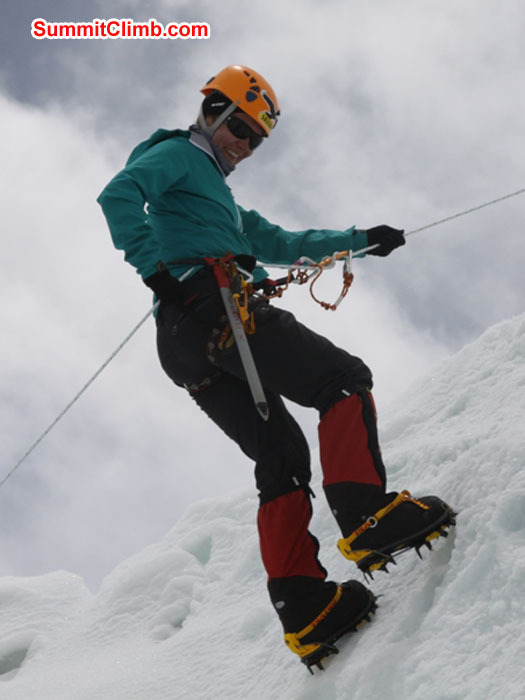 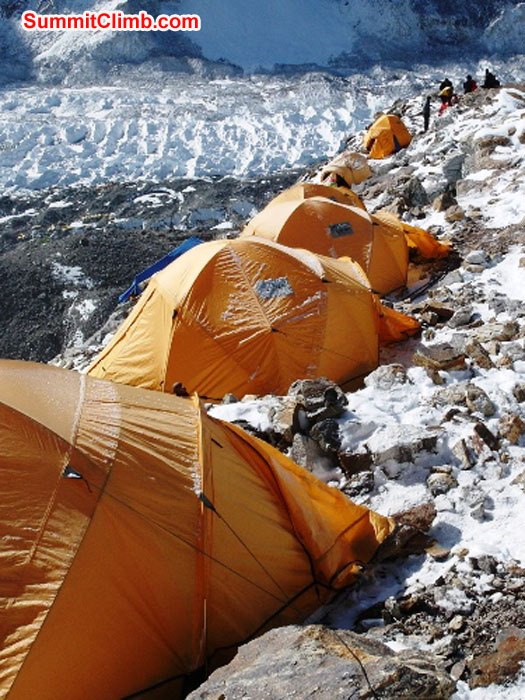 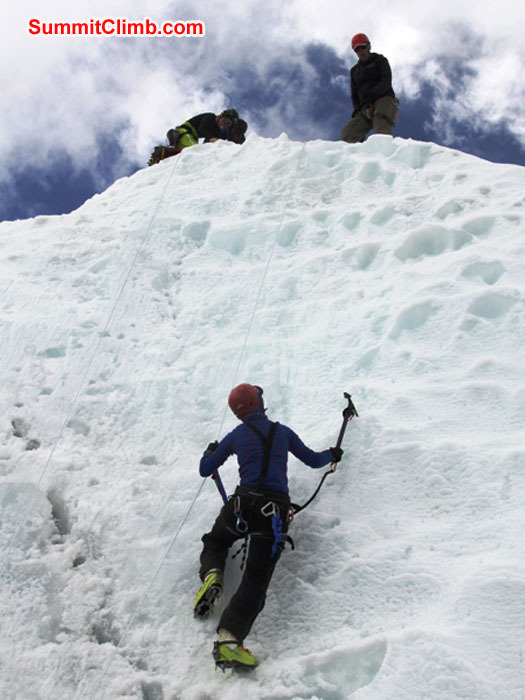 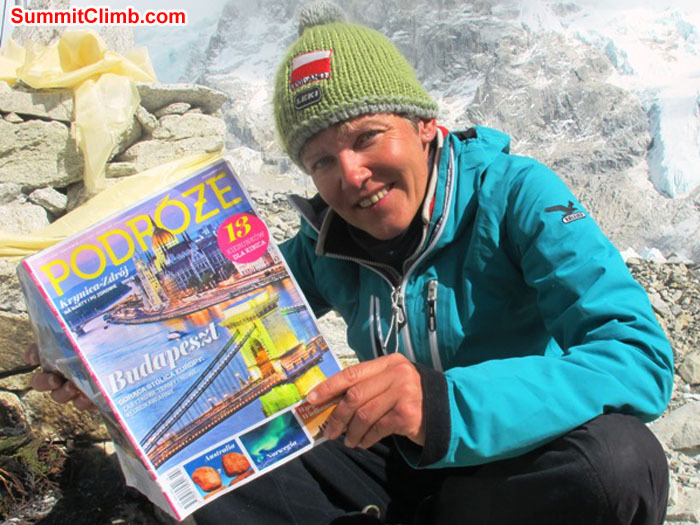 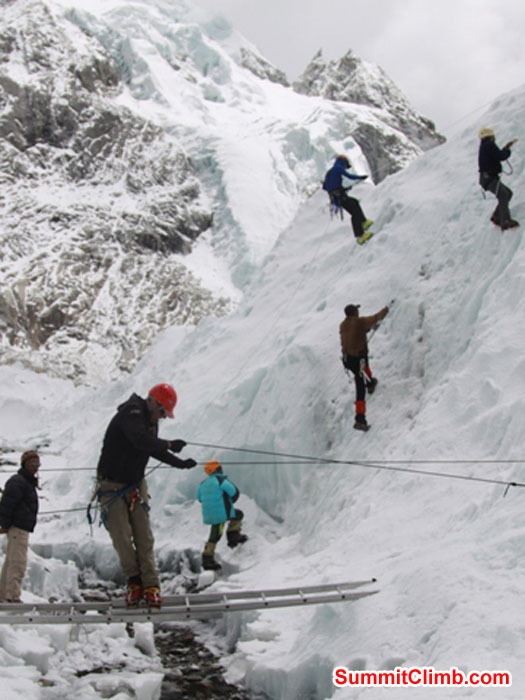 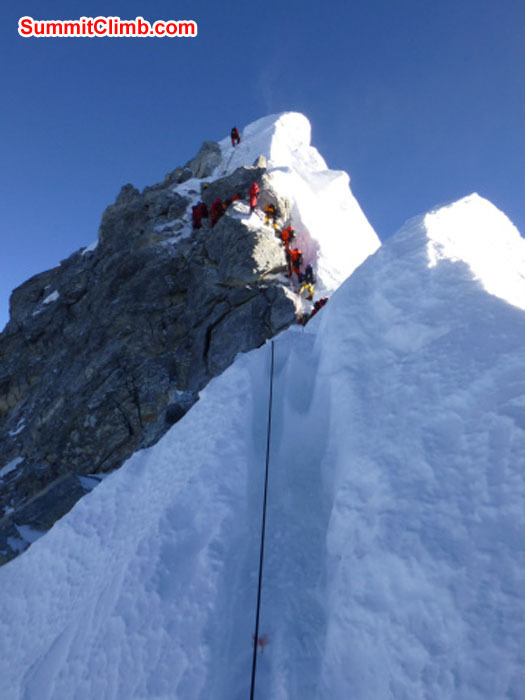 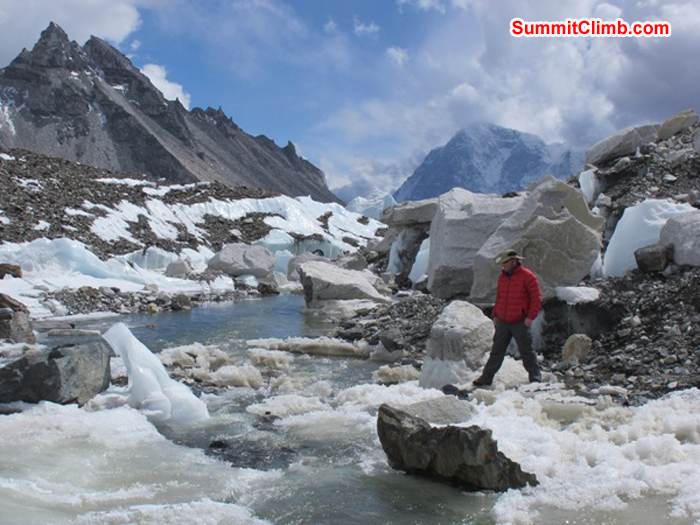 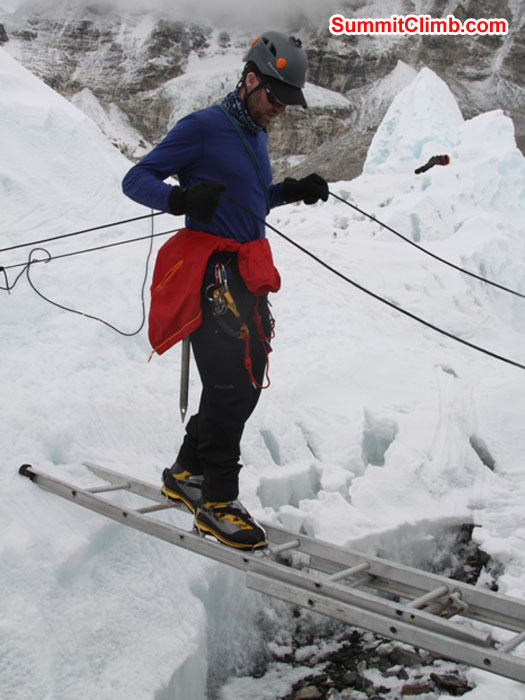 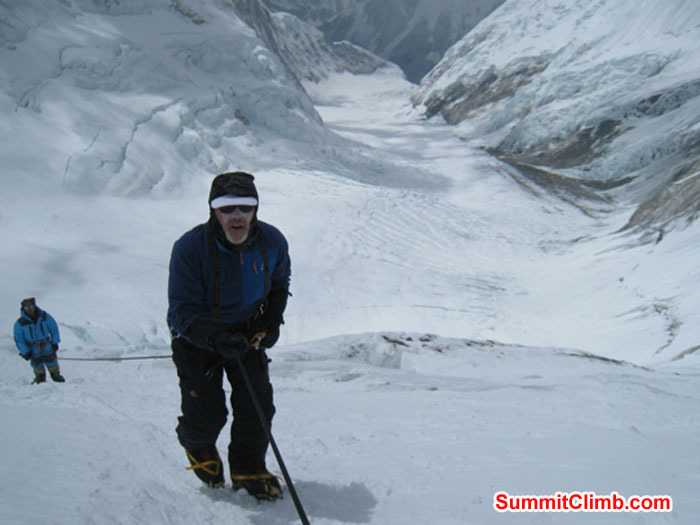 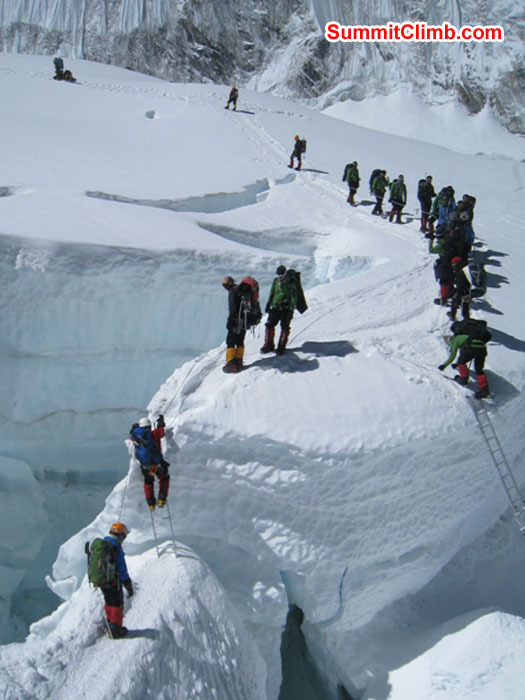 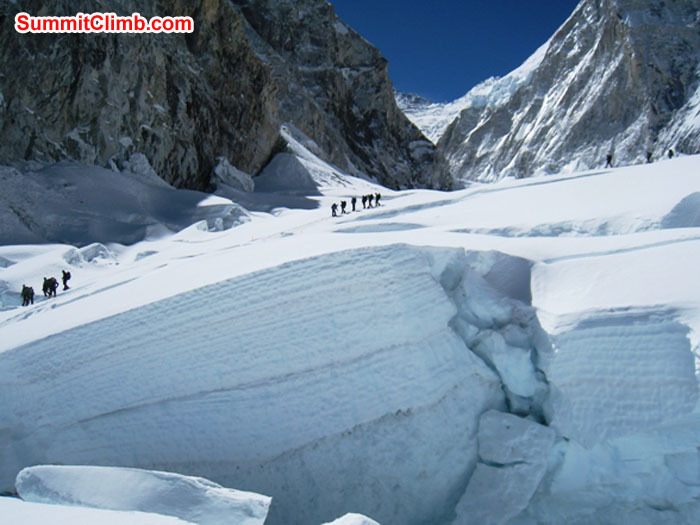 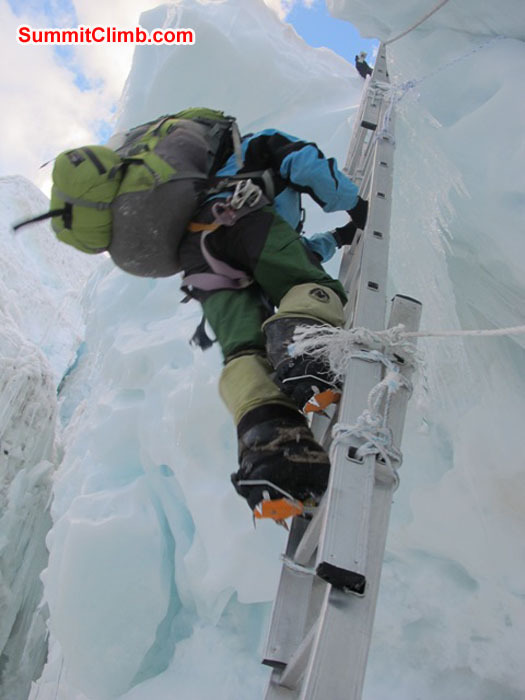 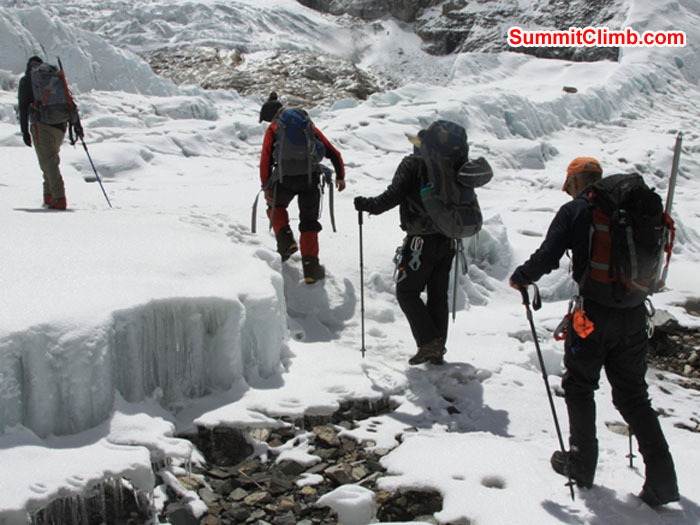 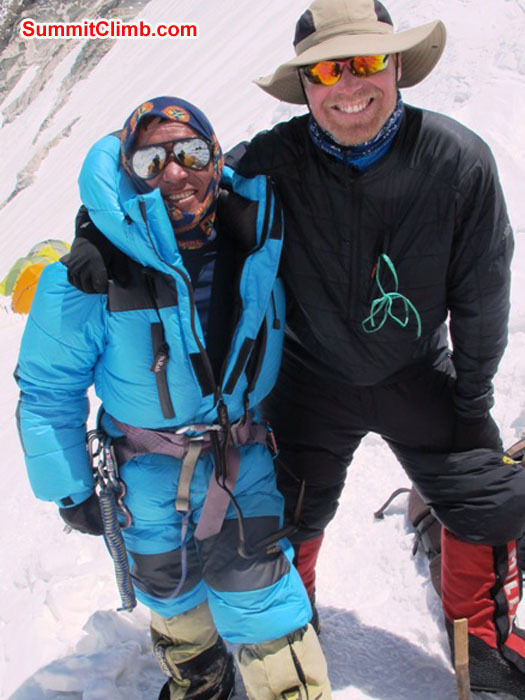 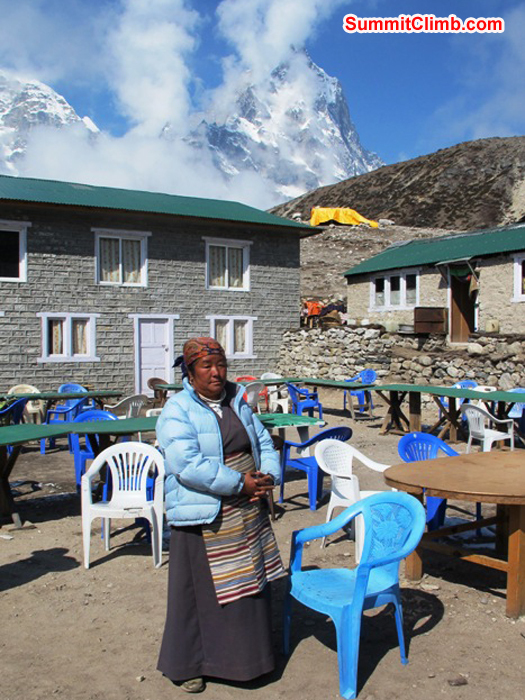 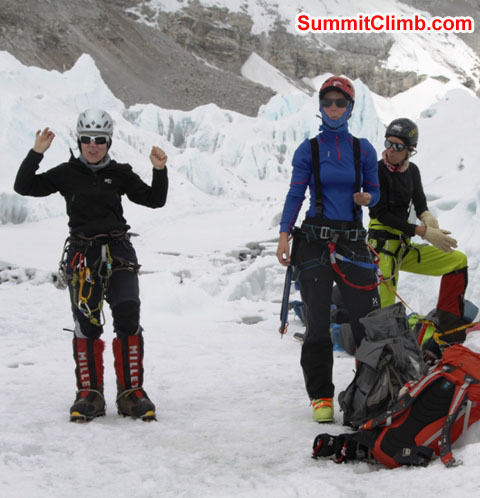 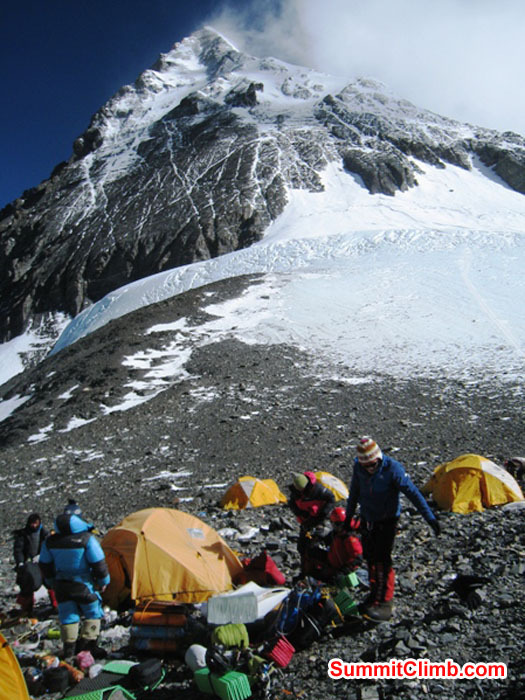 Actually we had two such groups during April and May and everyone in both groups did brilliantly, achieving their goals of reaching basecamp and trying to climb high above, through the massive Khumbu Icefall up to camps 1, 2, and 3. 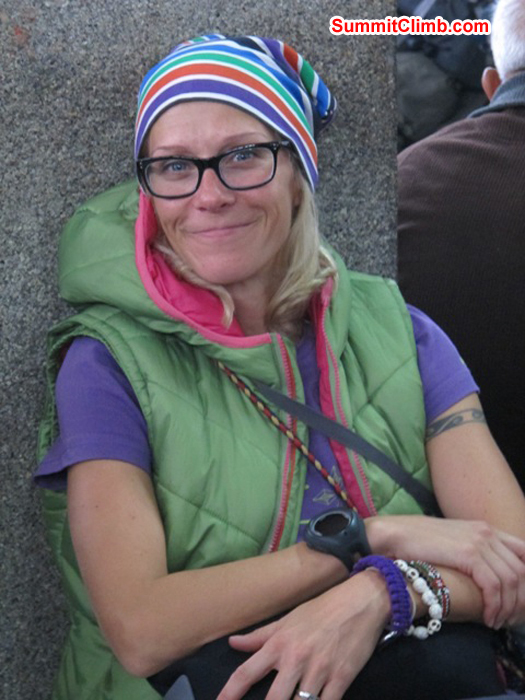 To begin we would like to send our heartfelt condolences to Michelle West who lost her mom back at home and had to leave our team early. 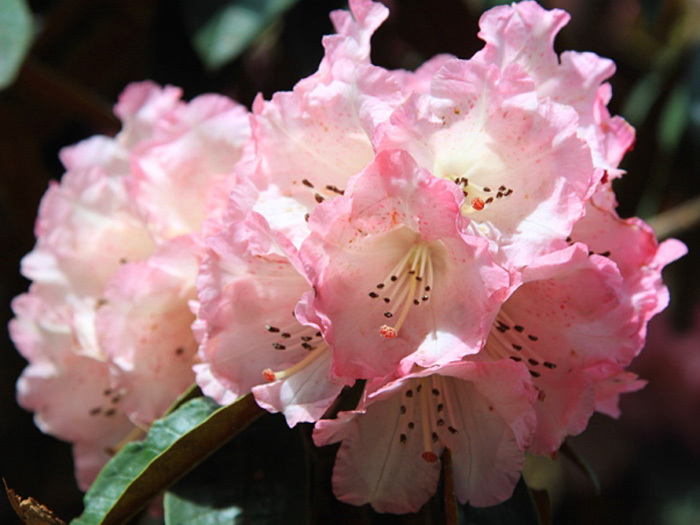 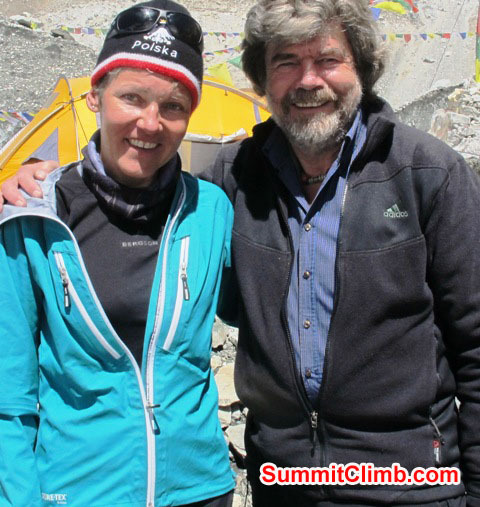 Our thoughts and deepest condolences go out to Michelle and her family. 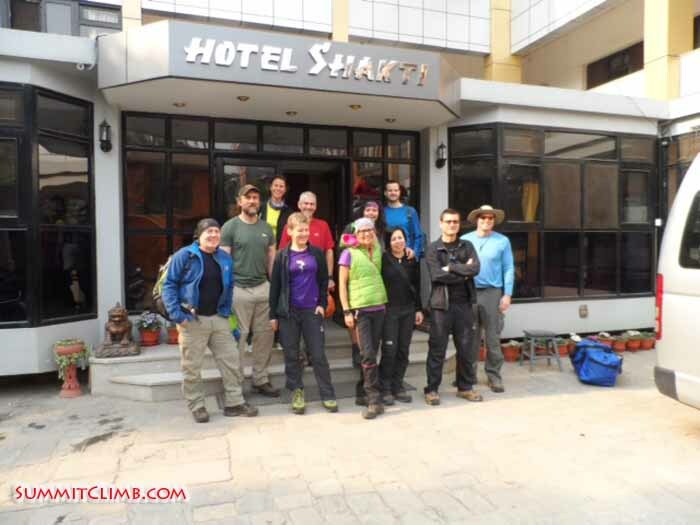 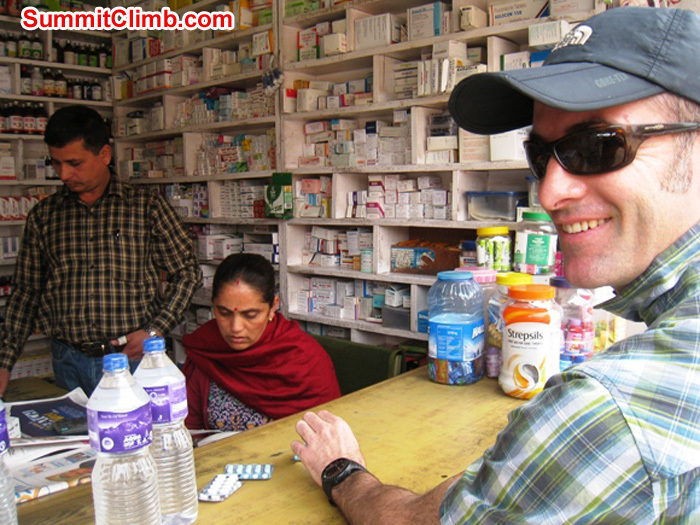 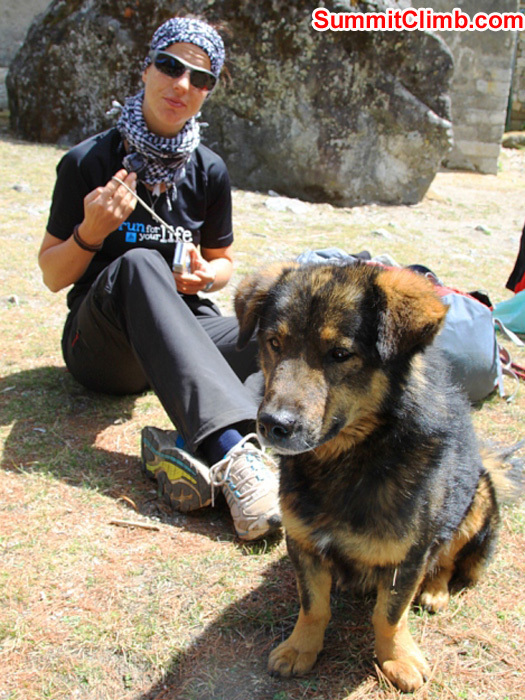 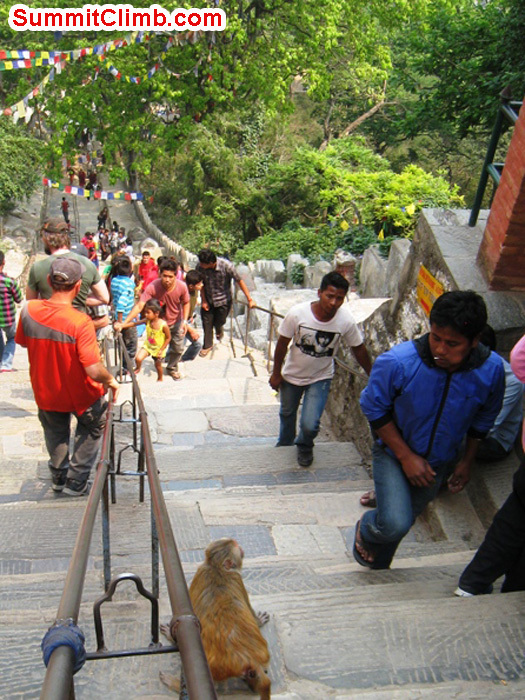 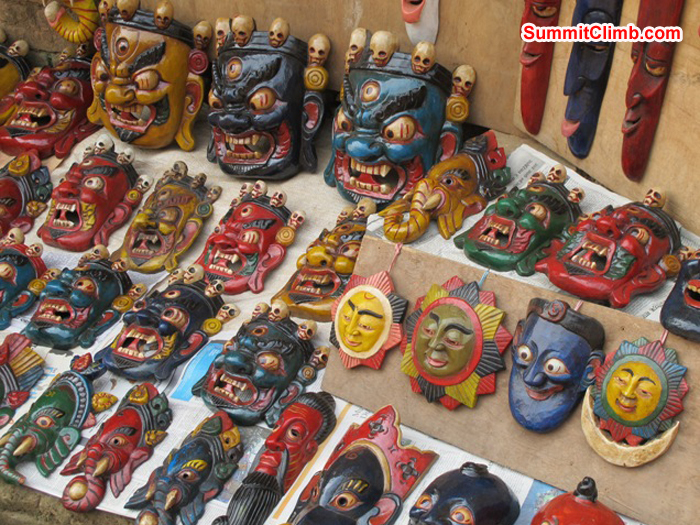 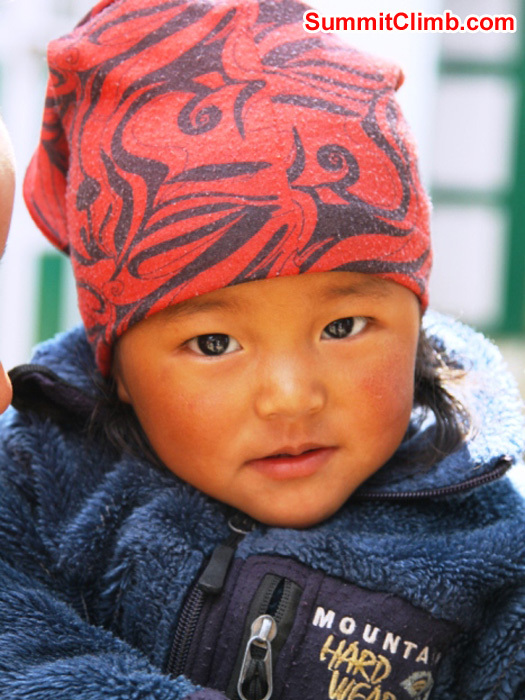 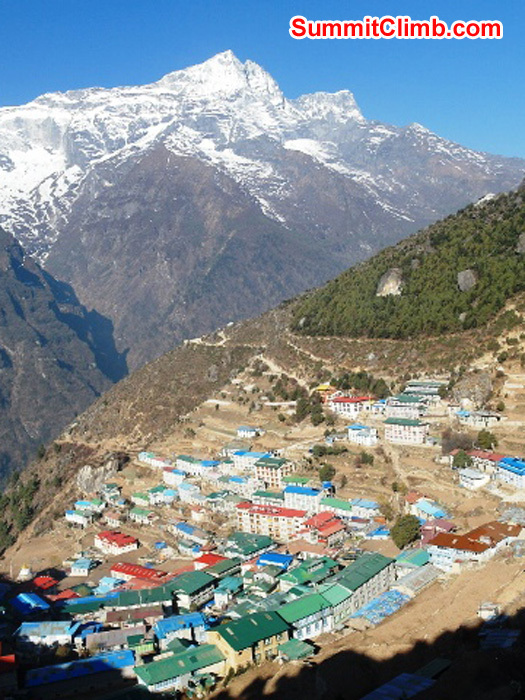 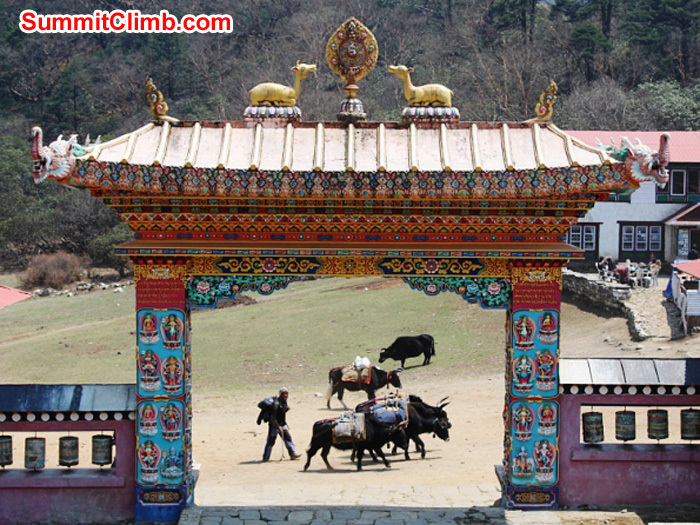 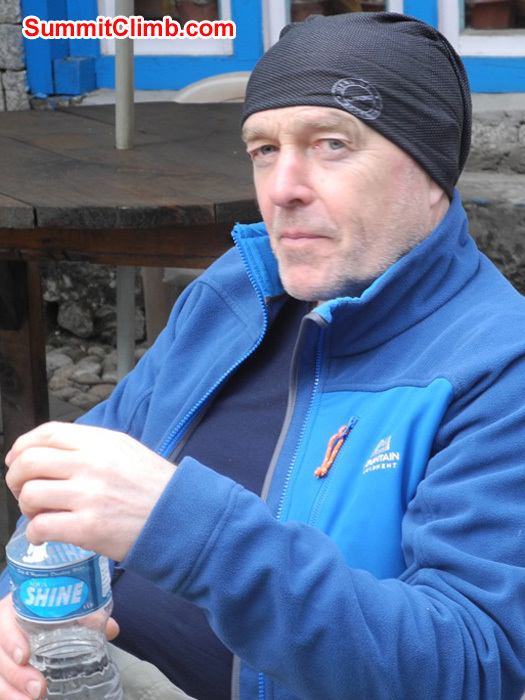 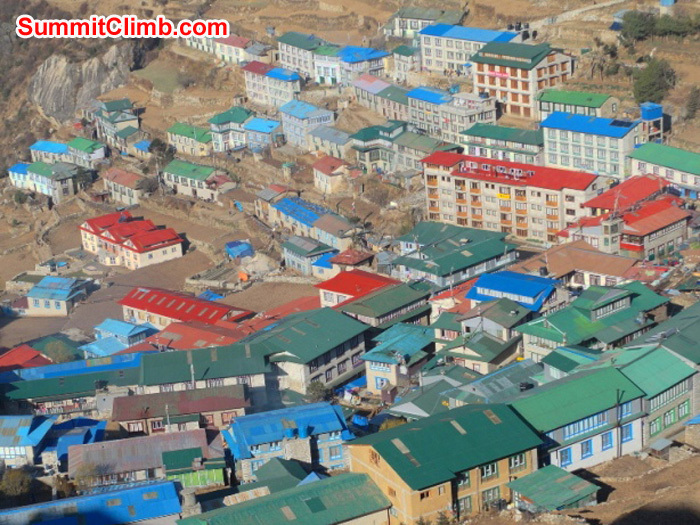 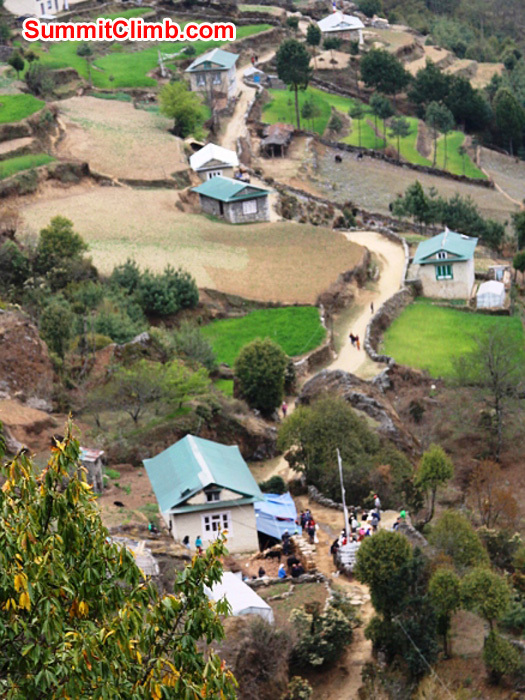 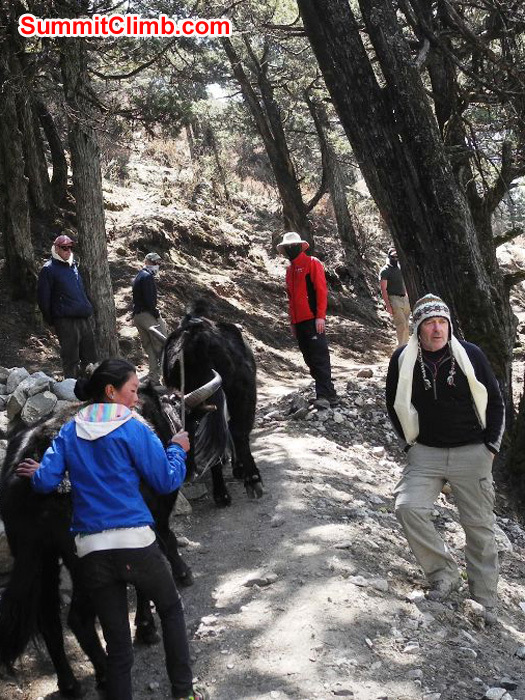 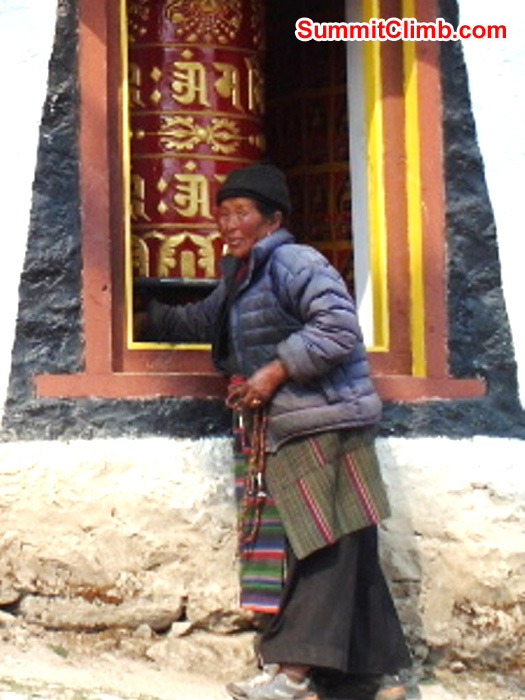 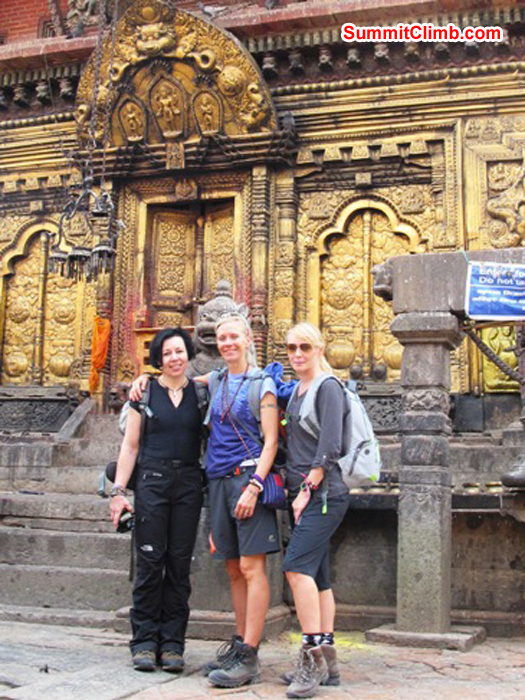 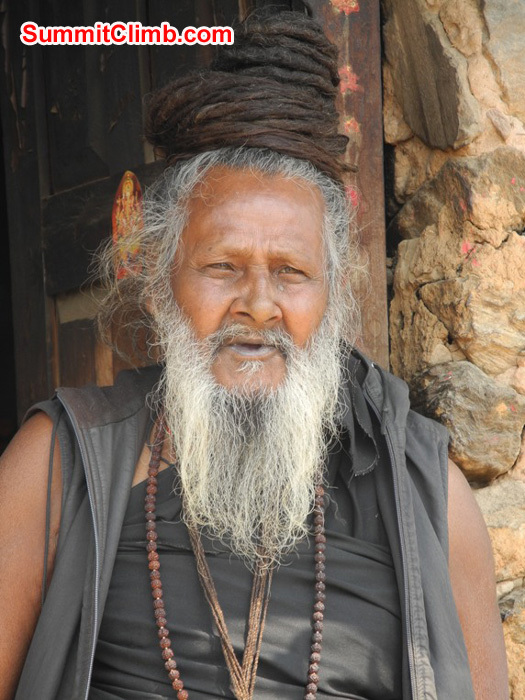 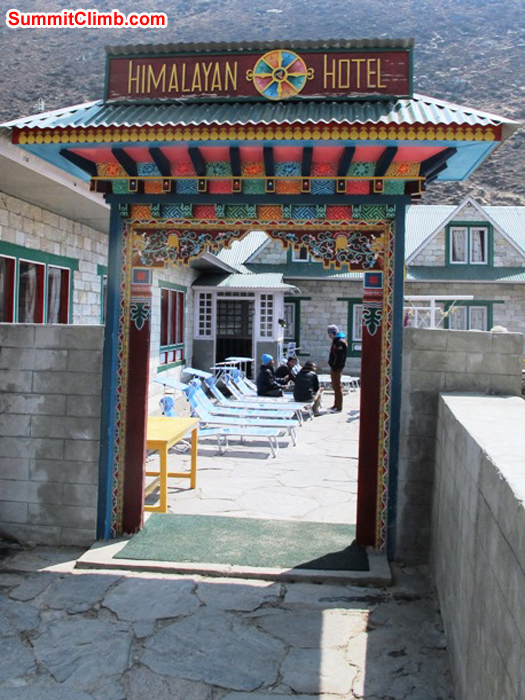 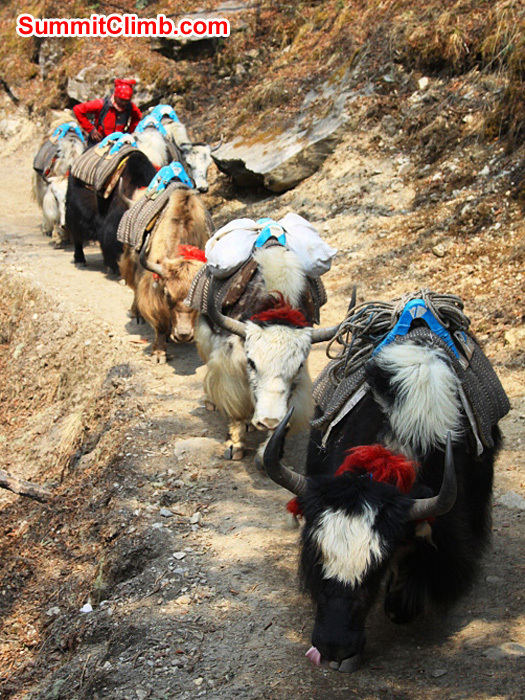 The rest of the team soldiered on with the flights up through Lukla, Namche, and on into the friendly hospitable high altitude Sherpa villages which make the "Khumbu Trek" so famous around the world. 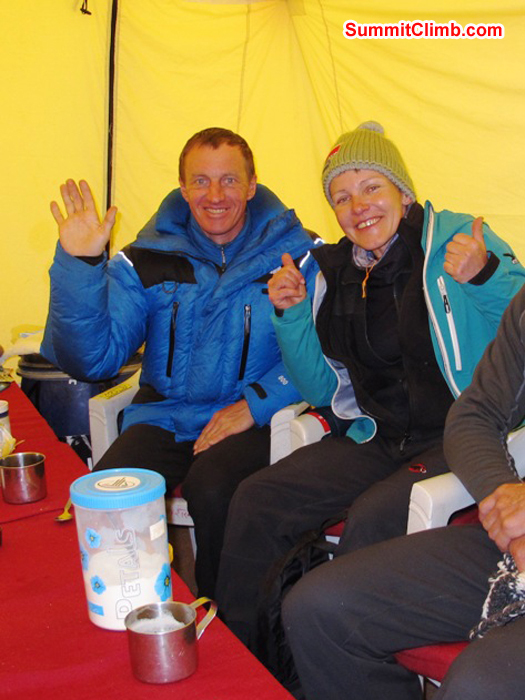 Dispatch 9 May . 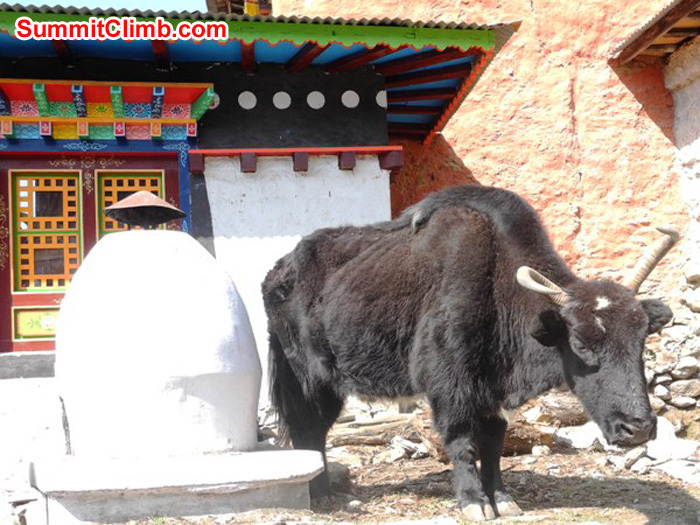 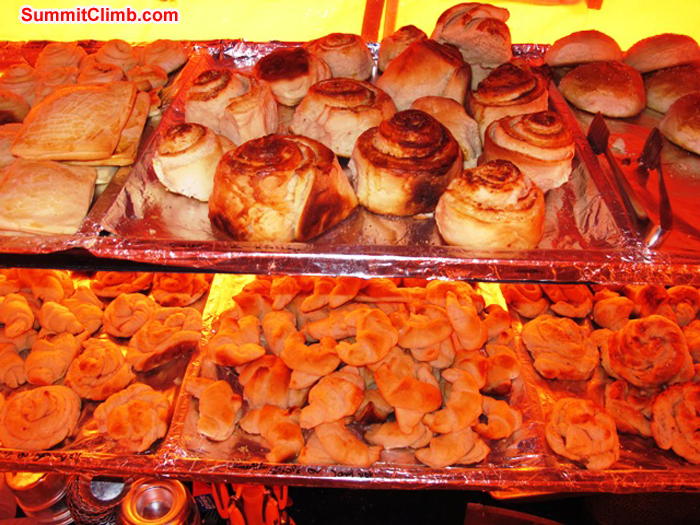 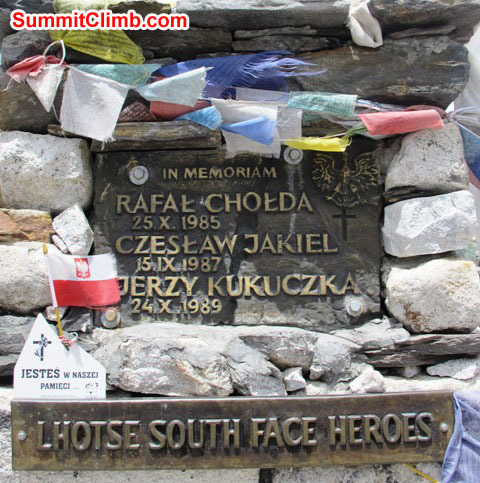 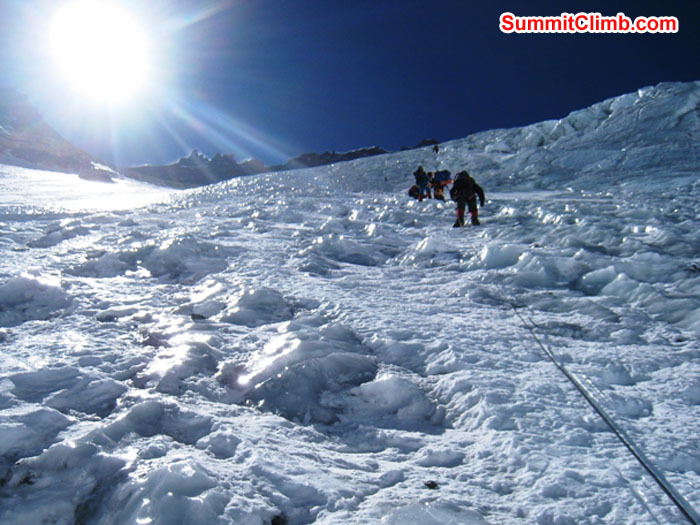 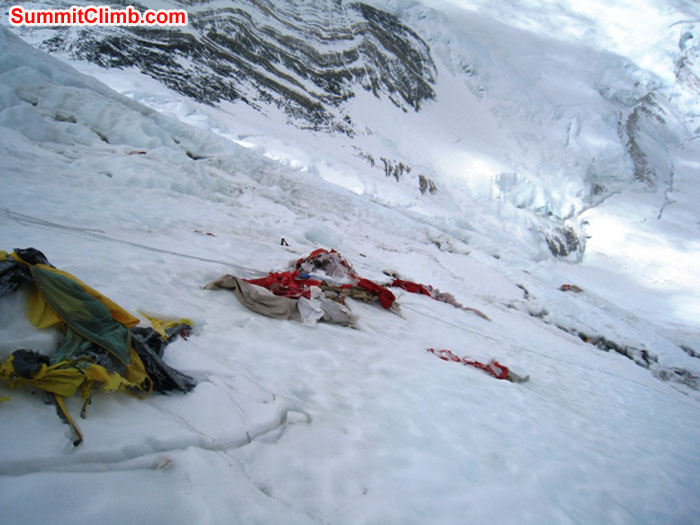 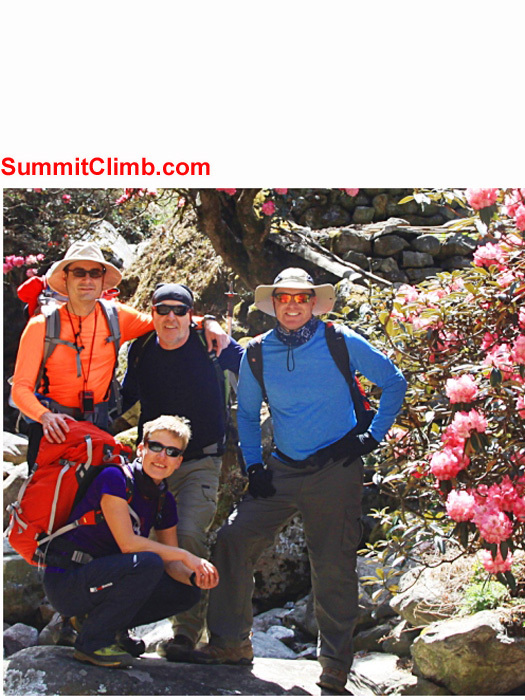 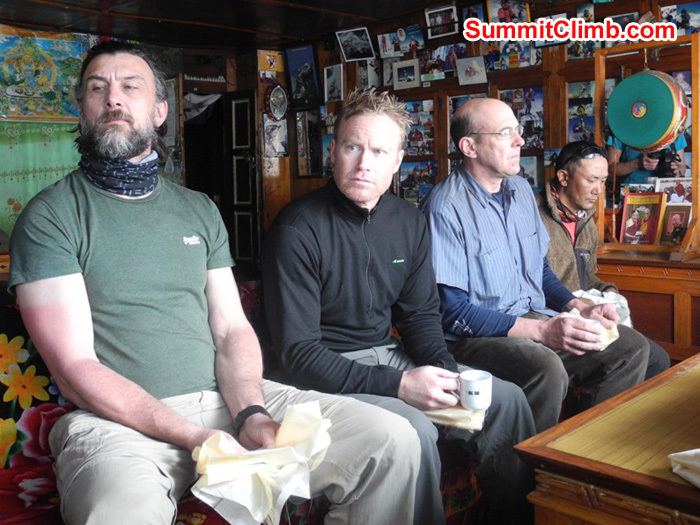 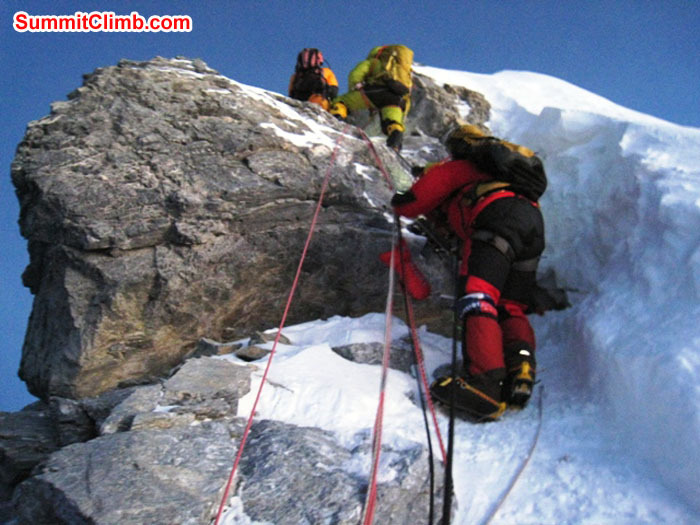 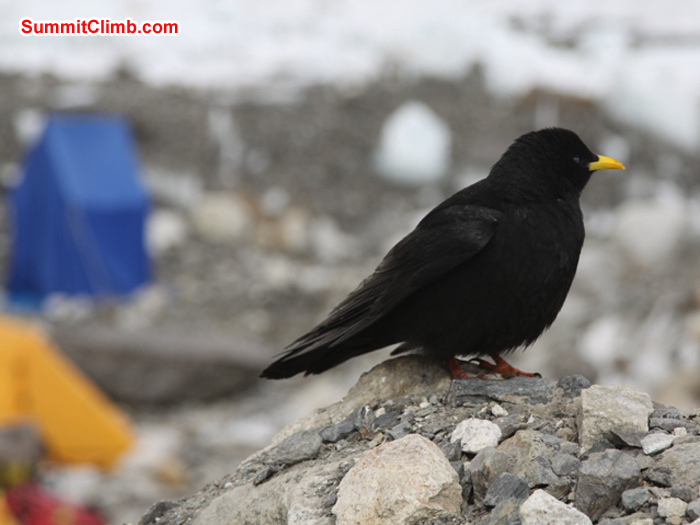 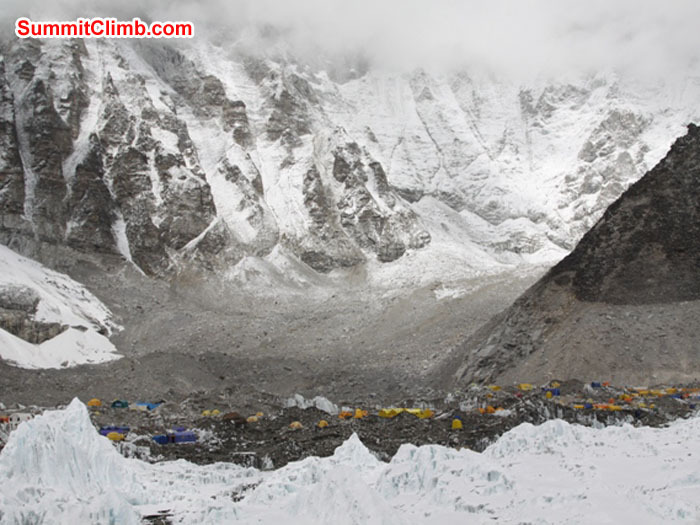 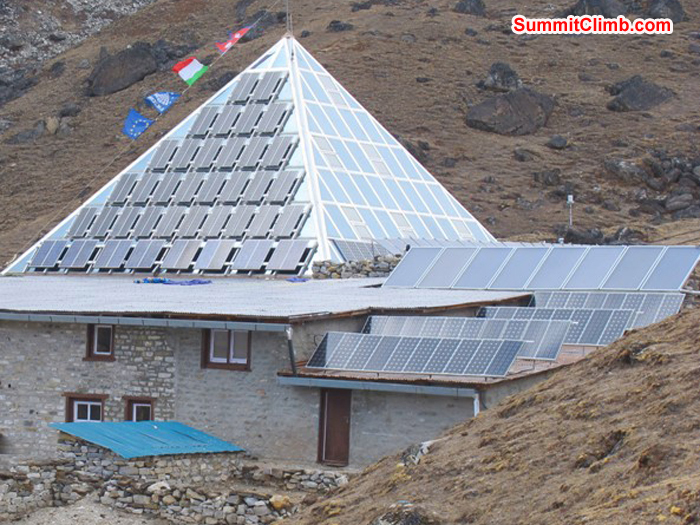 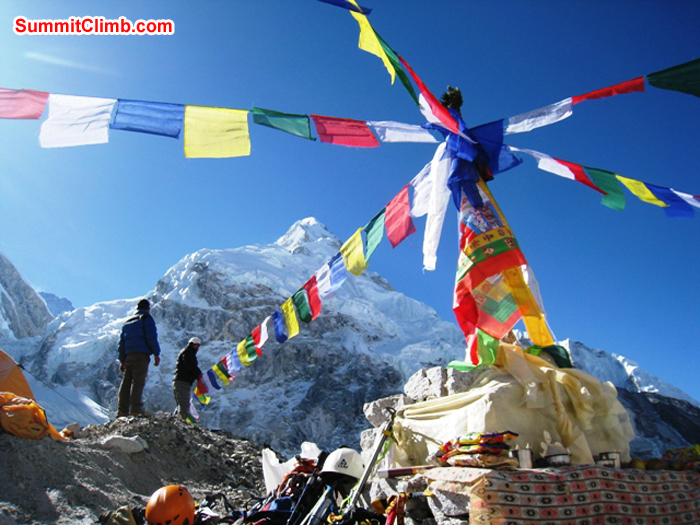 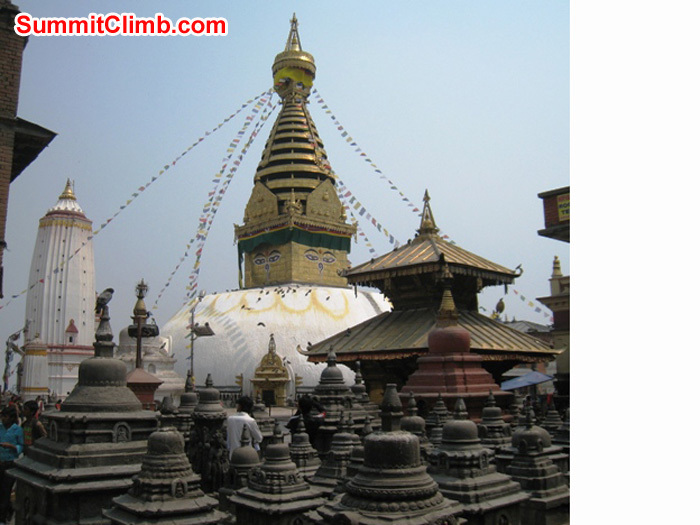 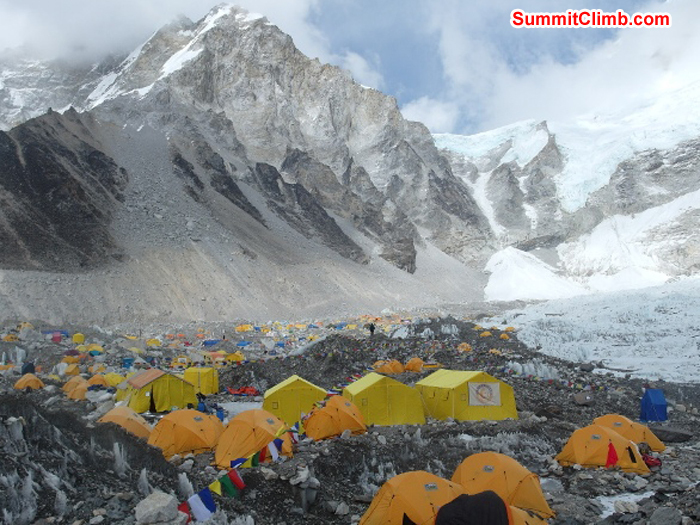 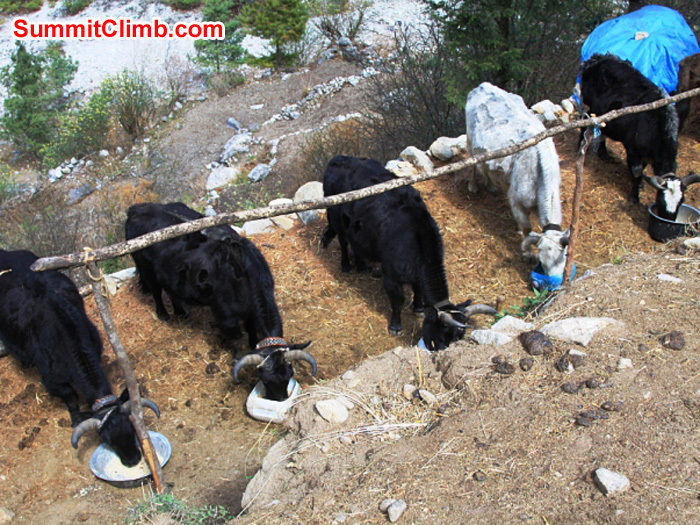 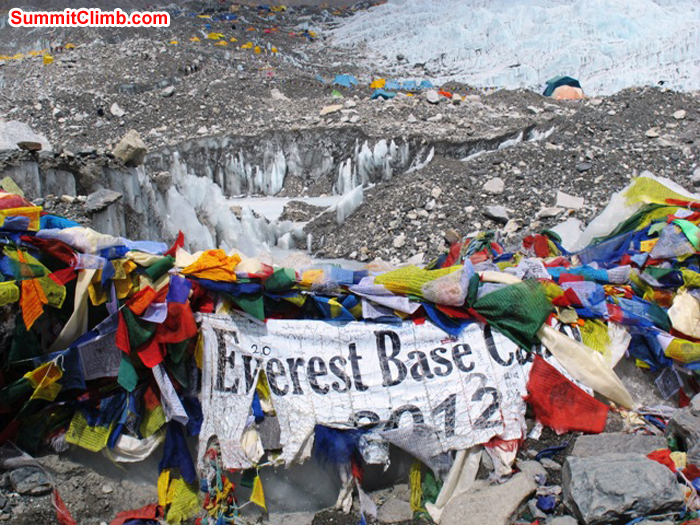 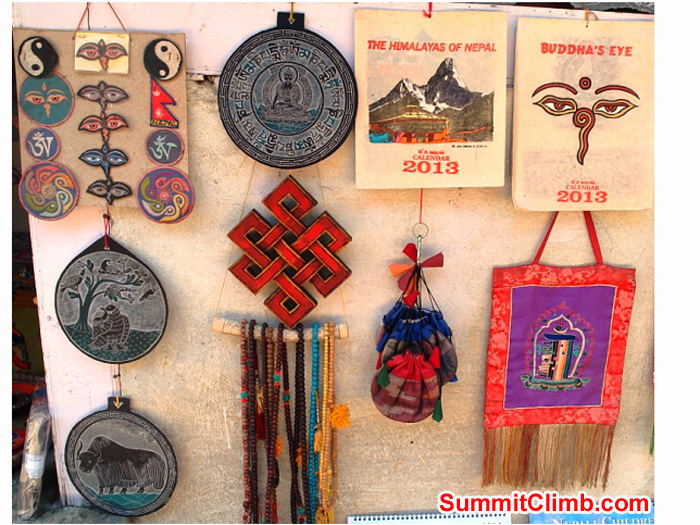 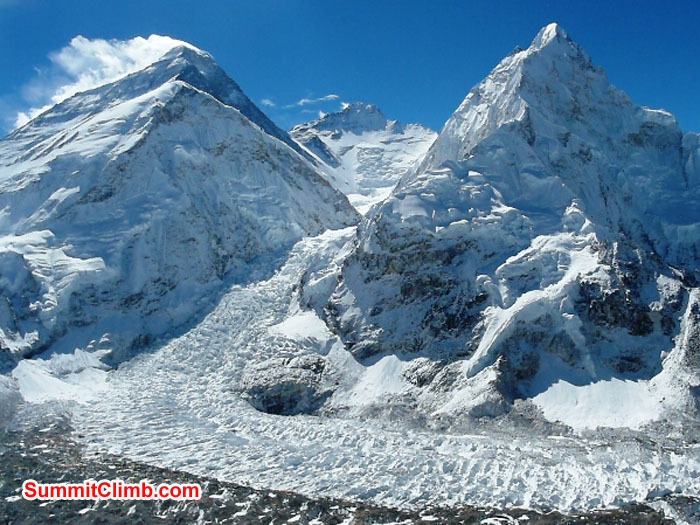 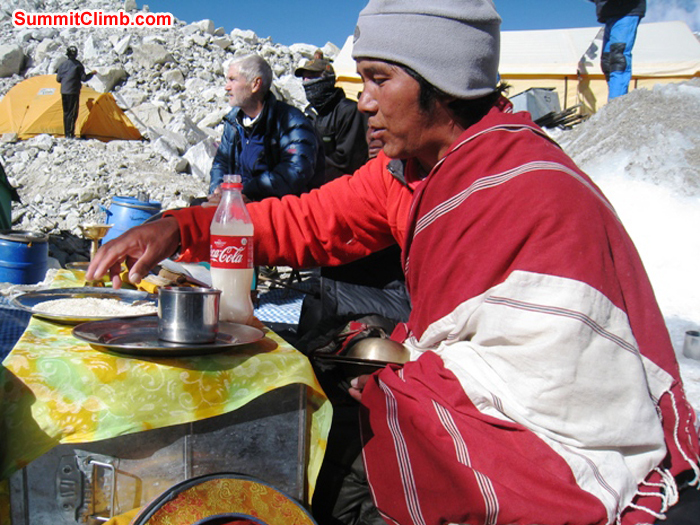 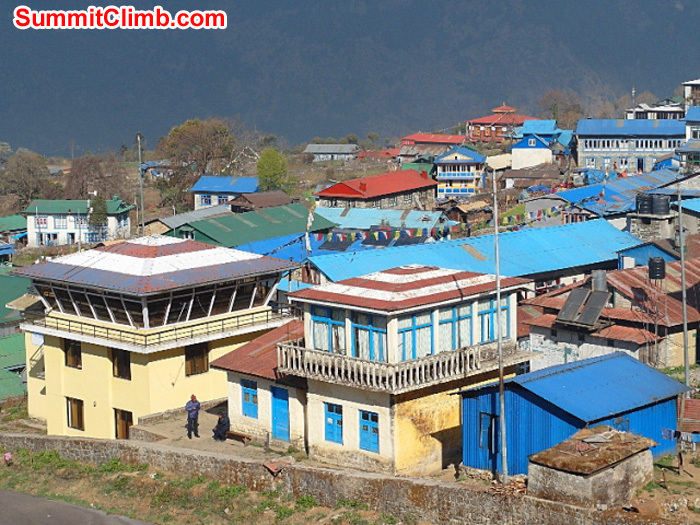 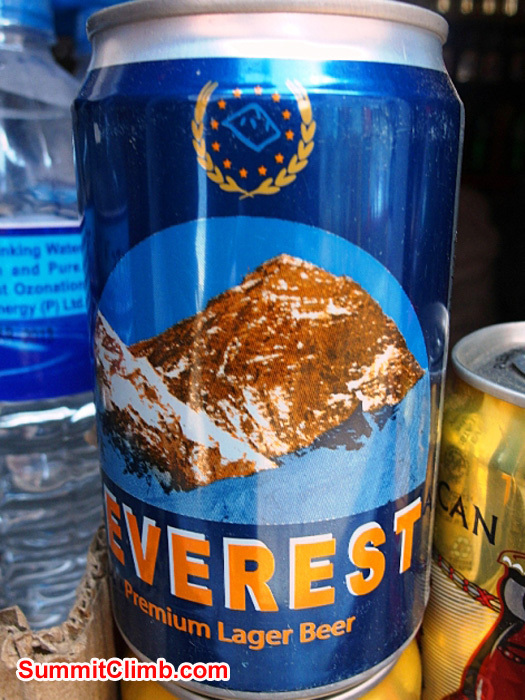 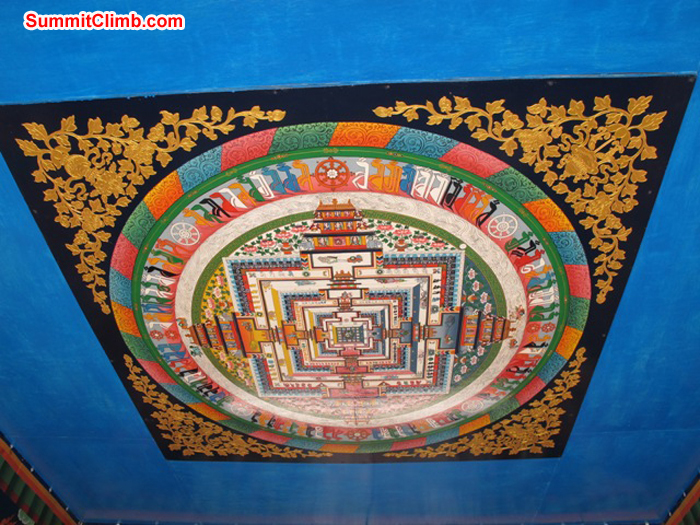 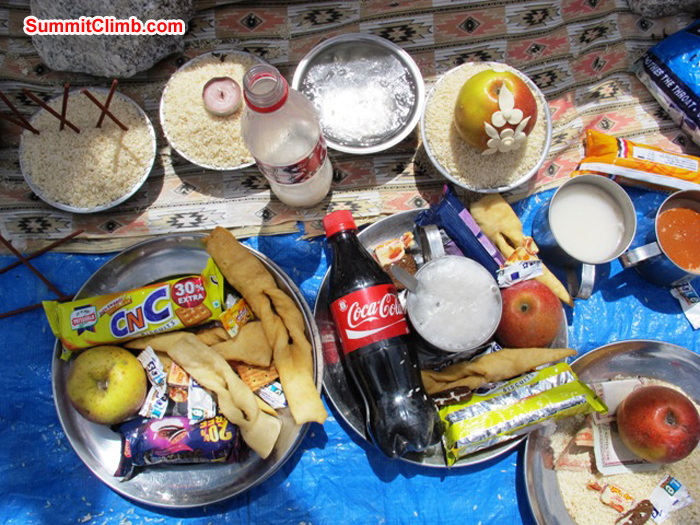 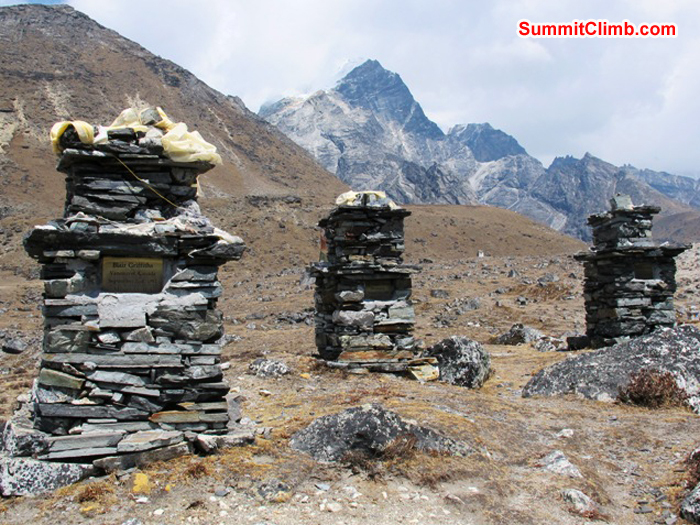 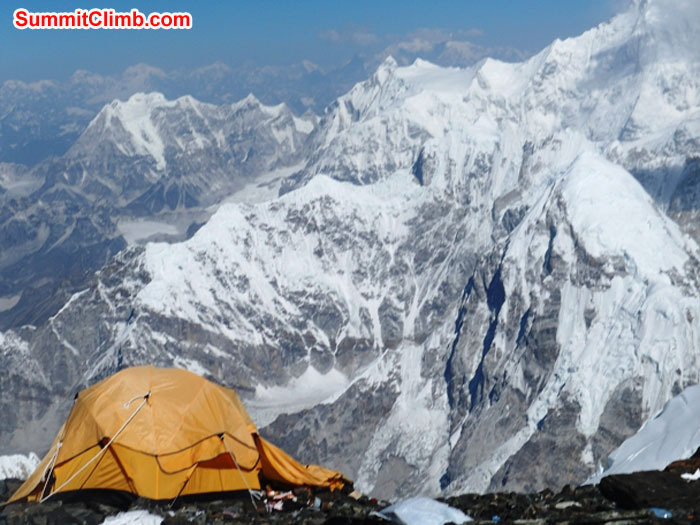 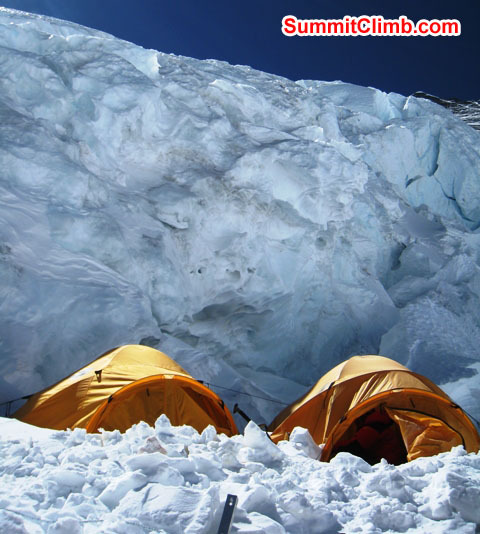 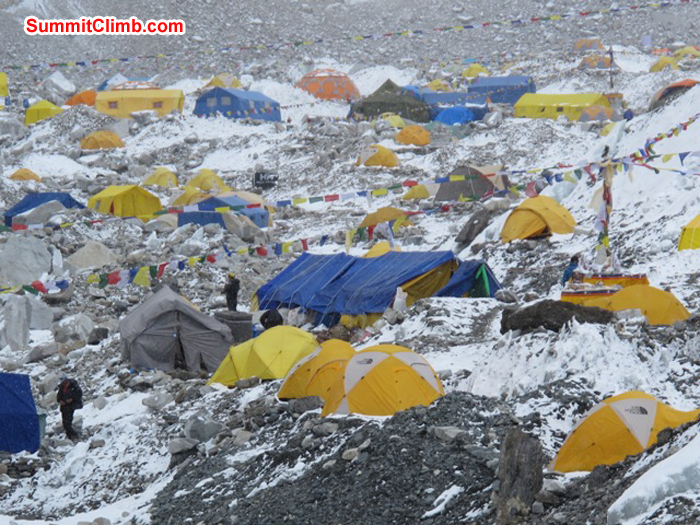 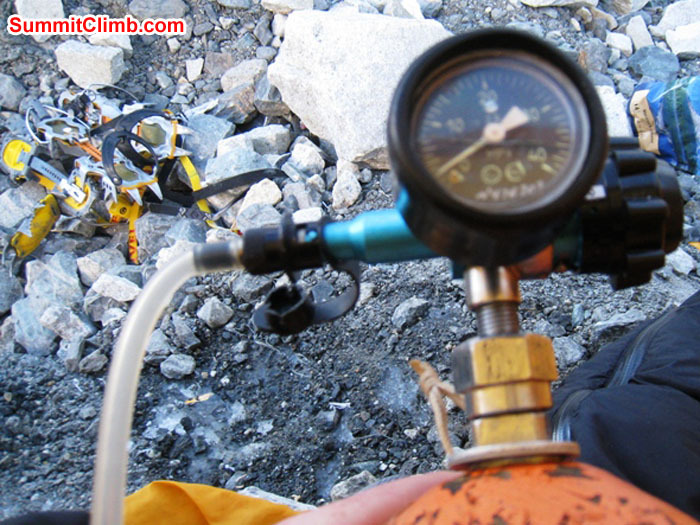 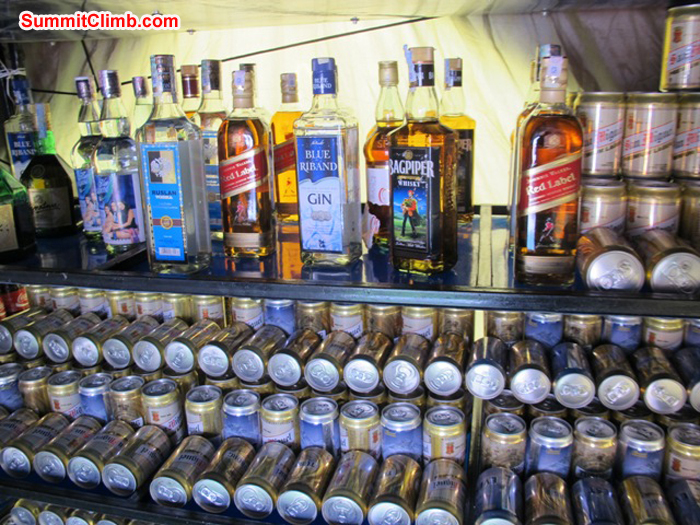 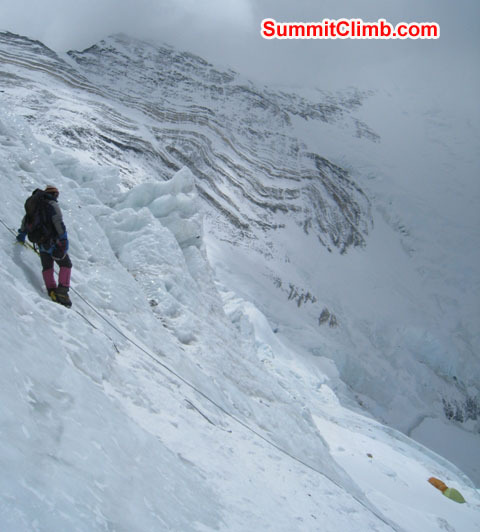 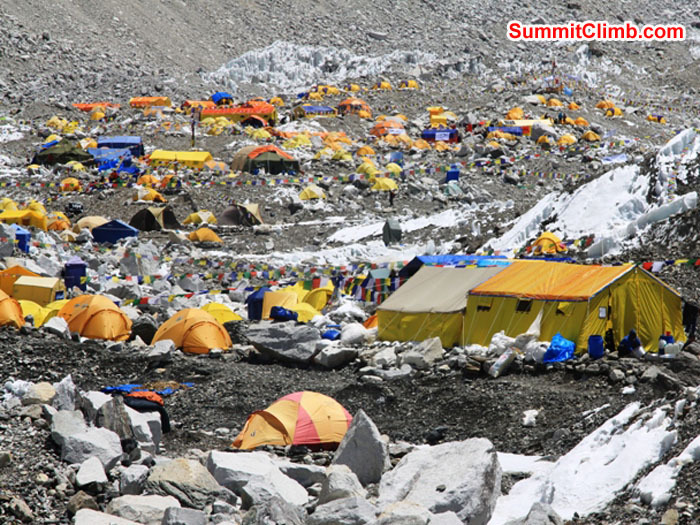 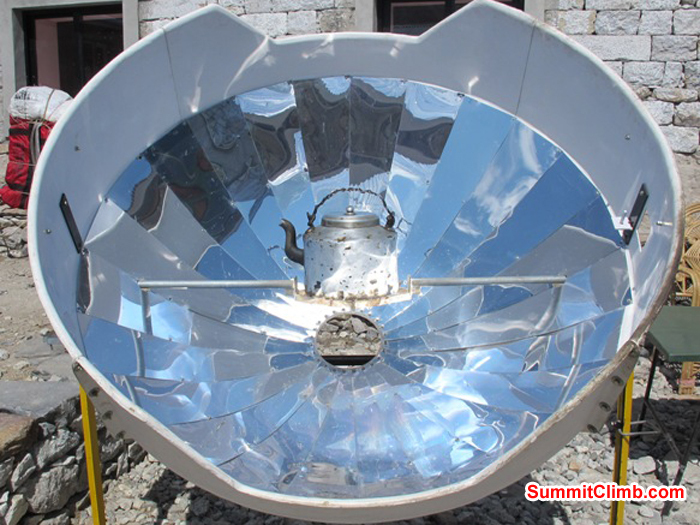 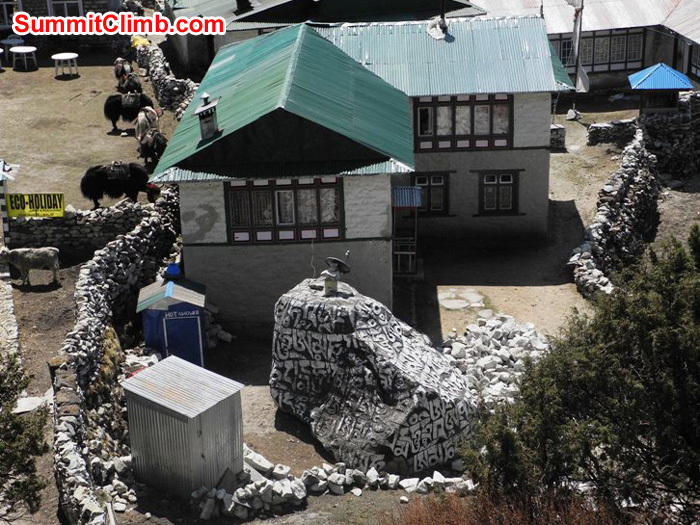 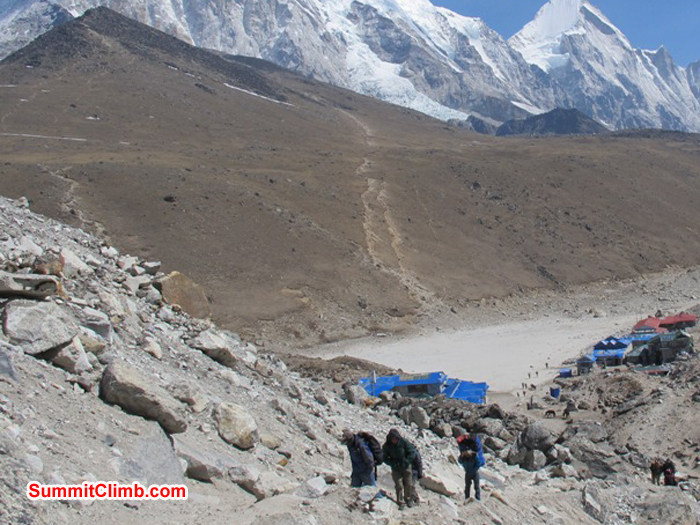 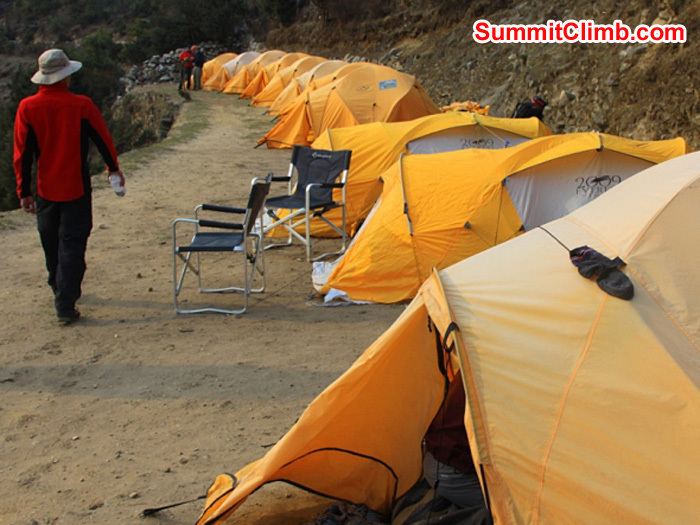 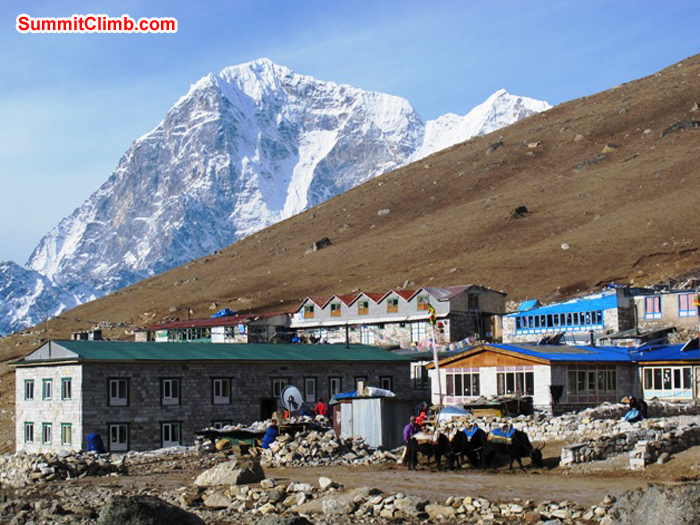 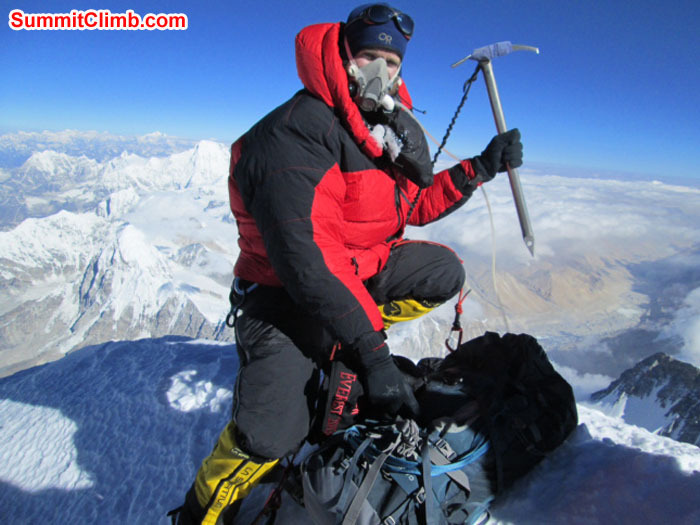 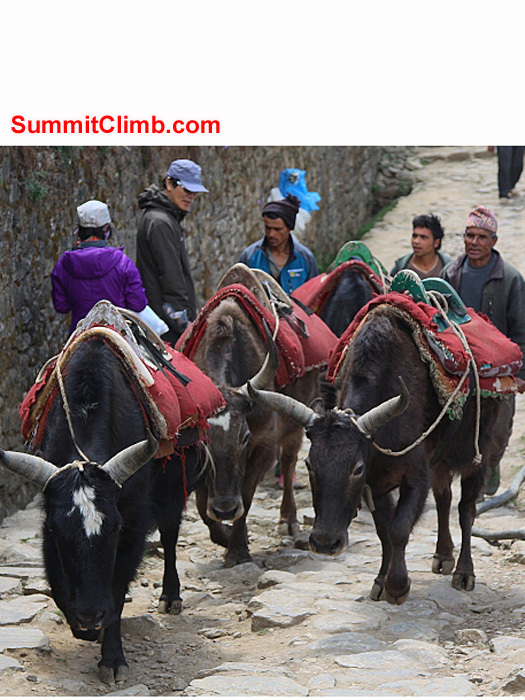 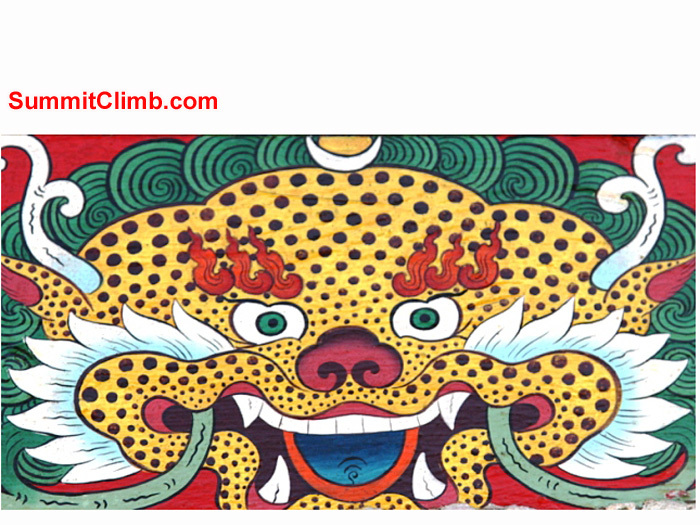 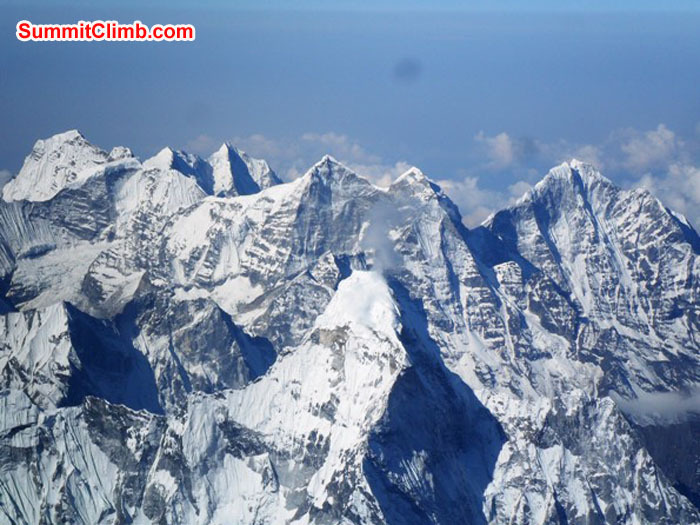 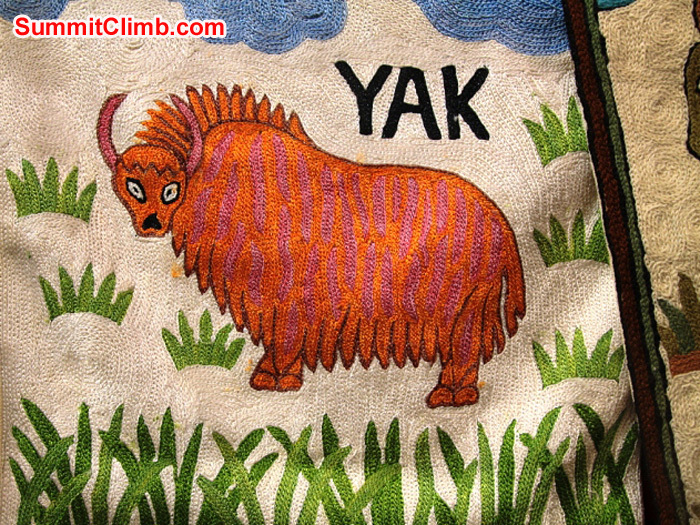 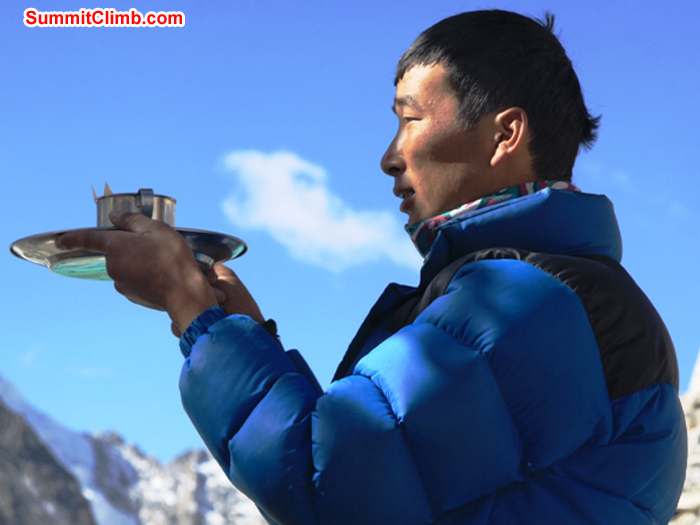 Everest, Lhotse, Camp 3 Training Climb, Basecamp Trek. 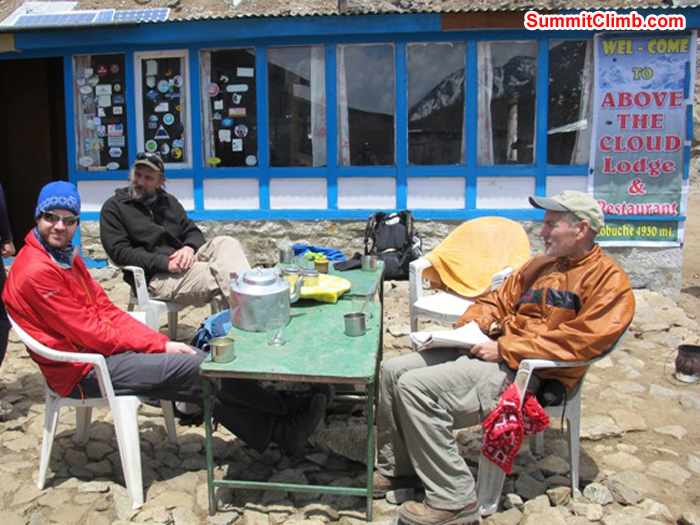 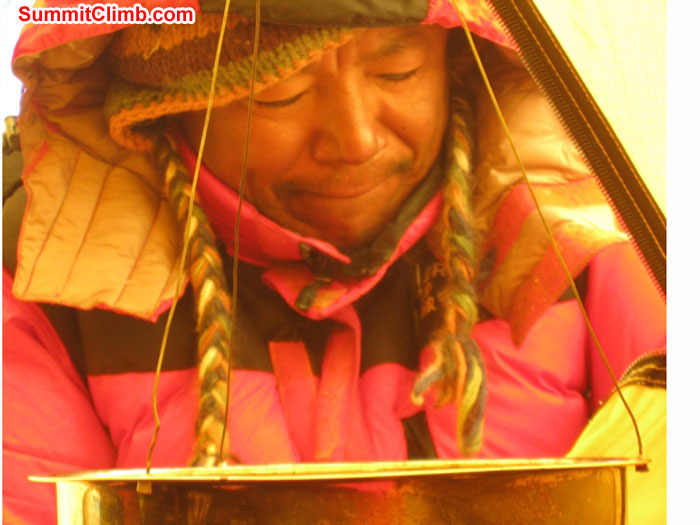 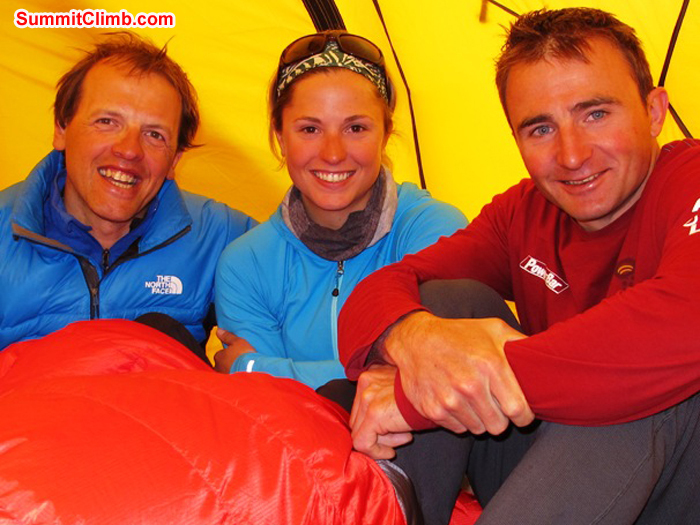 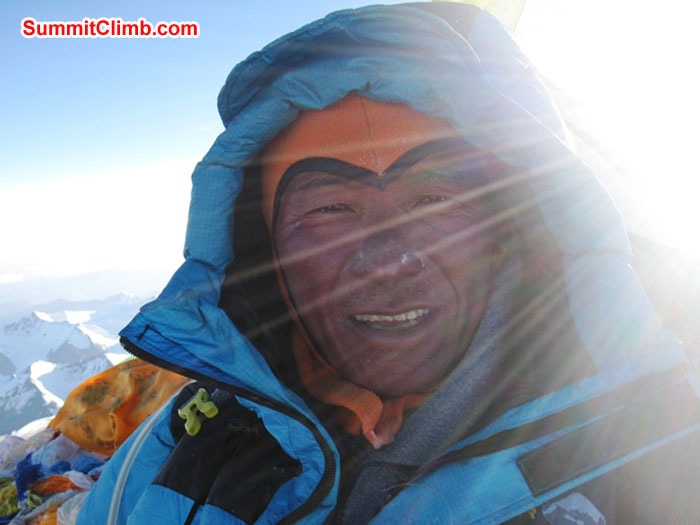 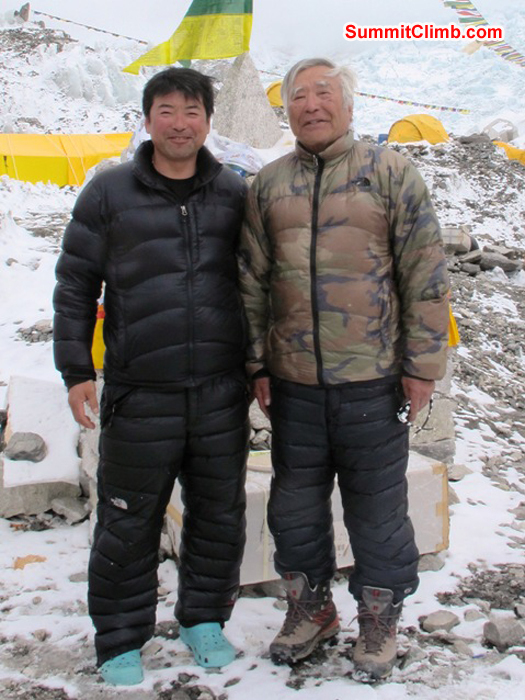 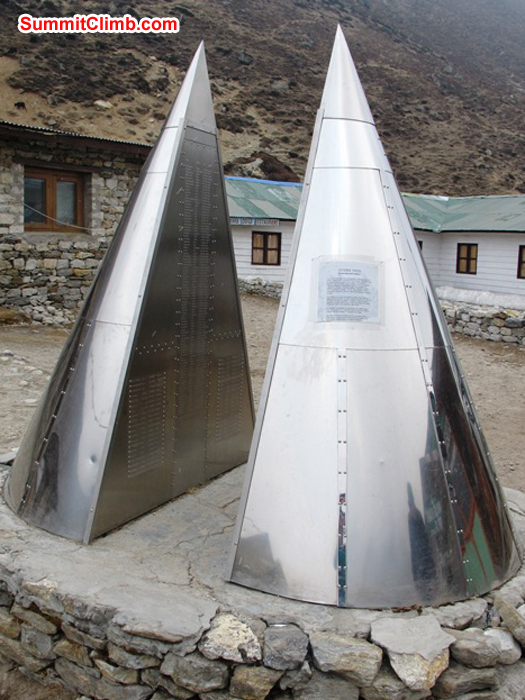 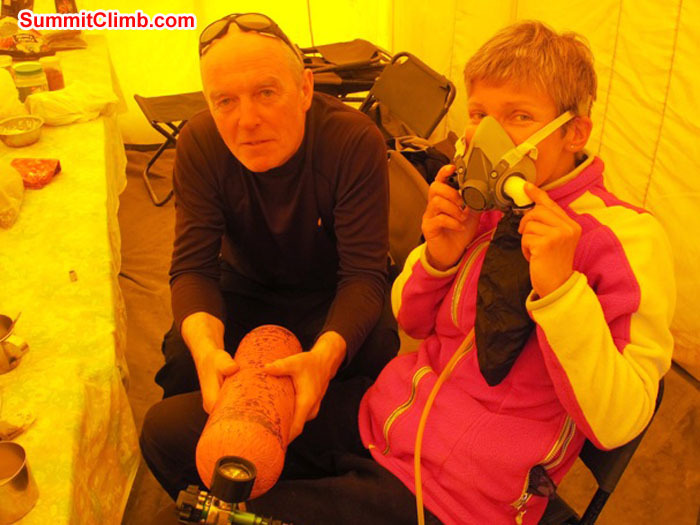 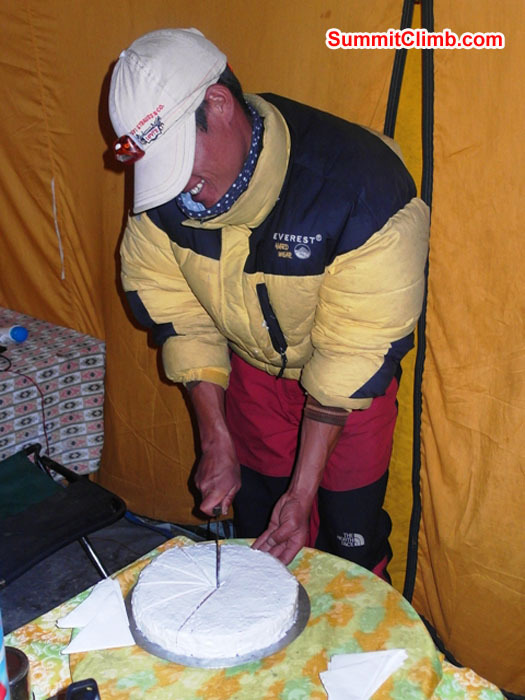 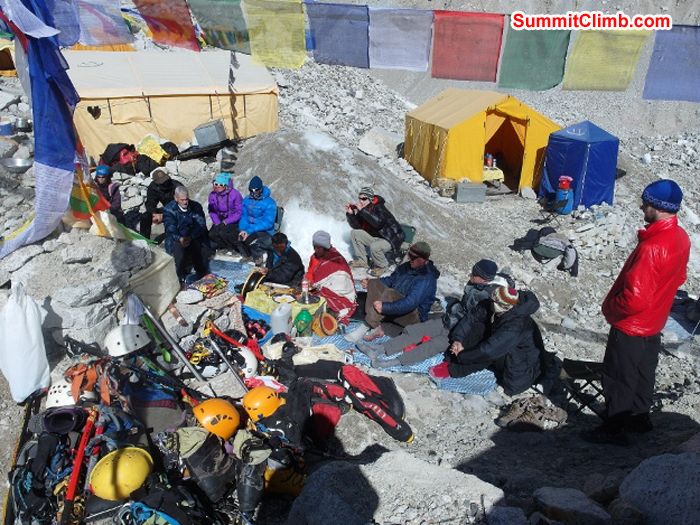 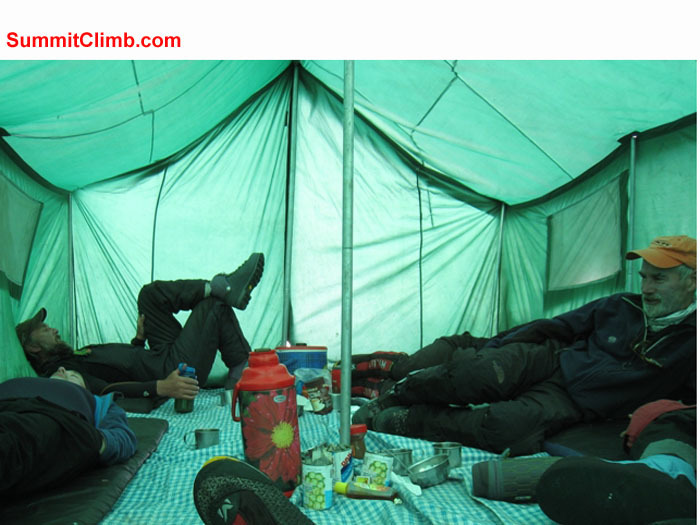 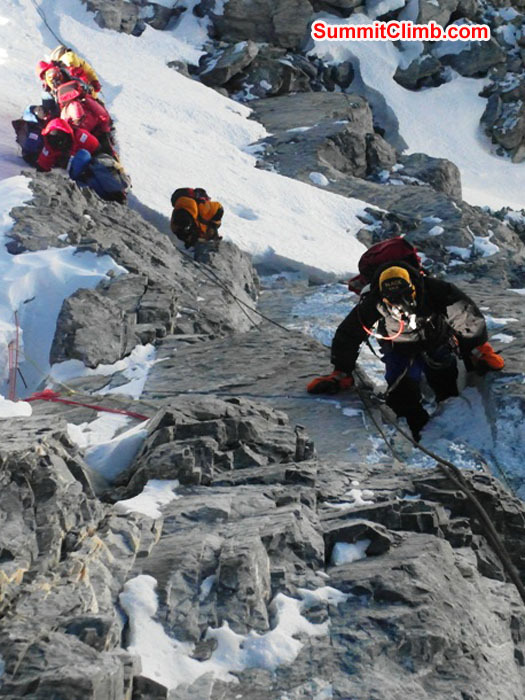 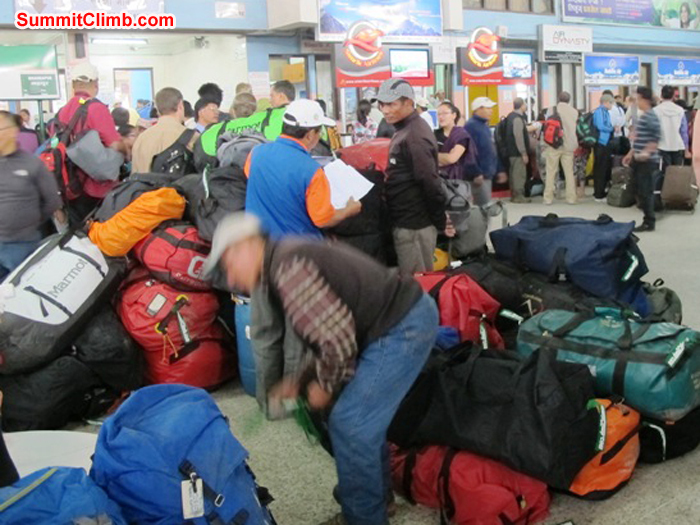 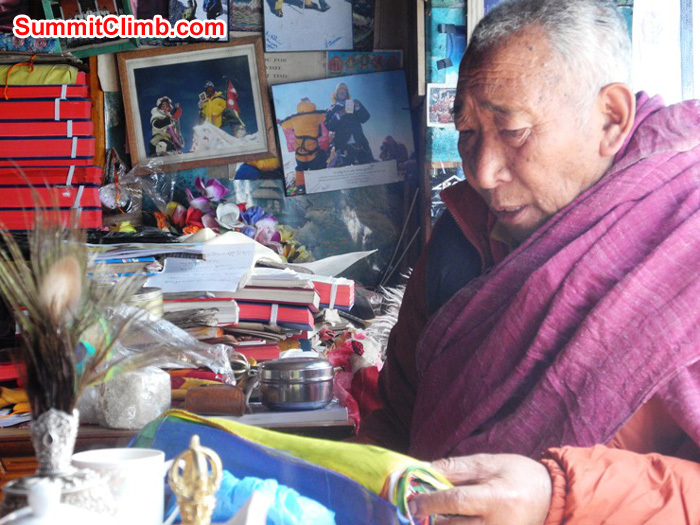 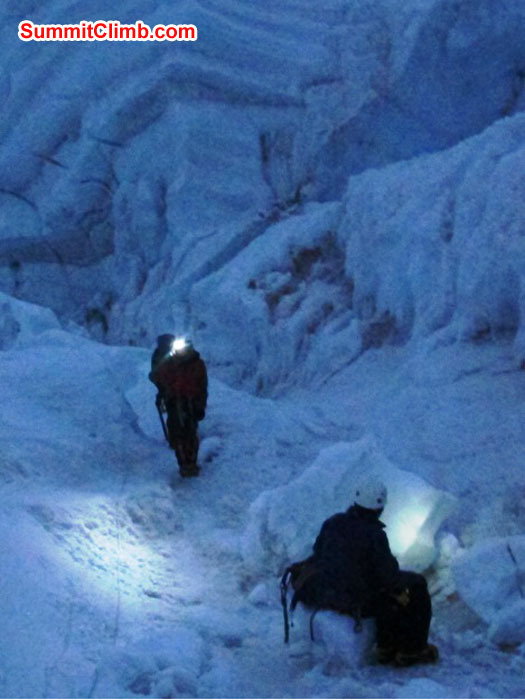 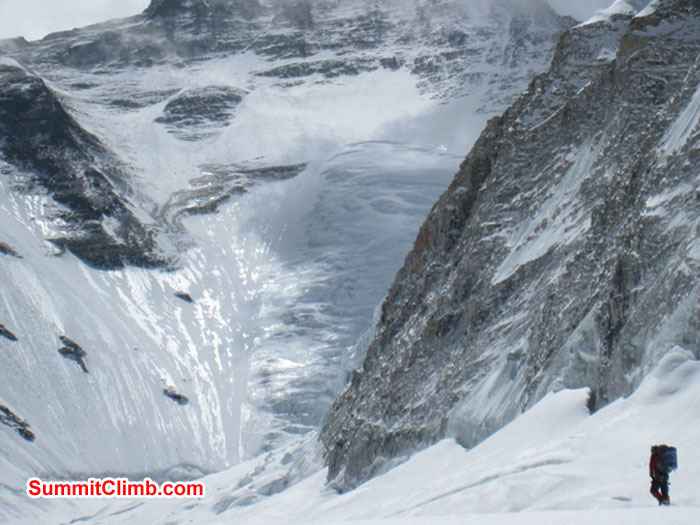 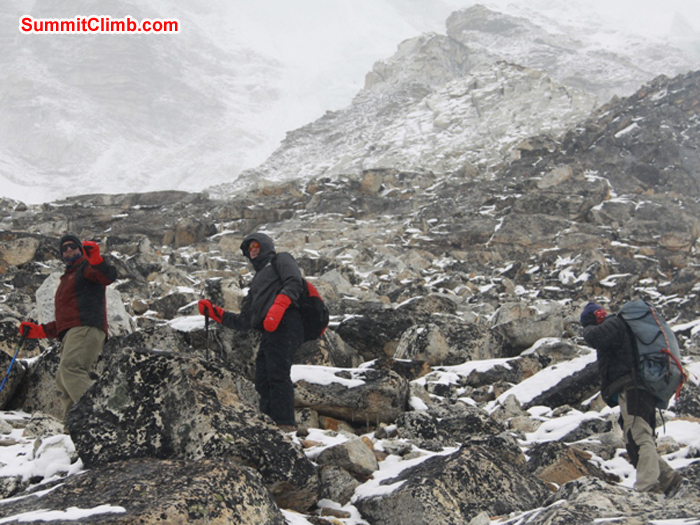 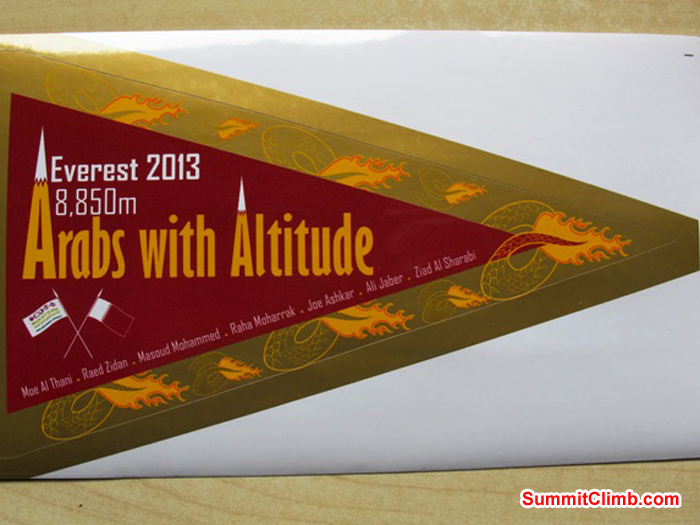 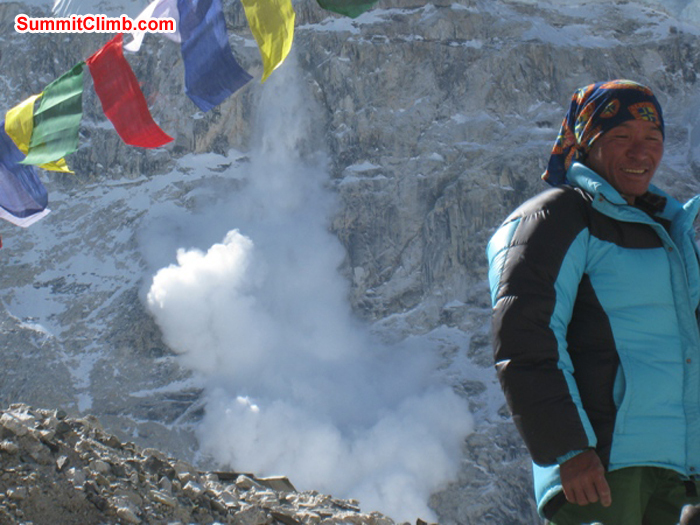 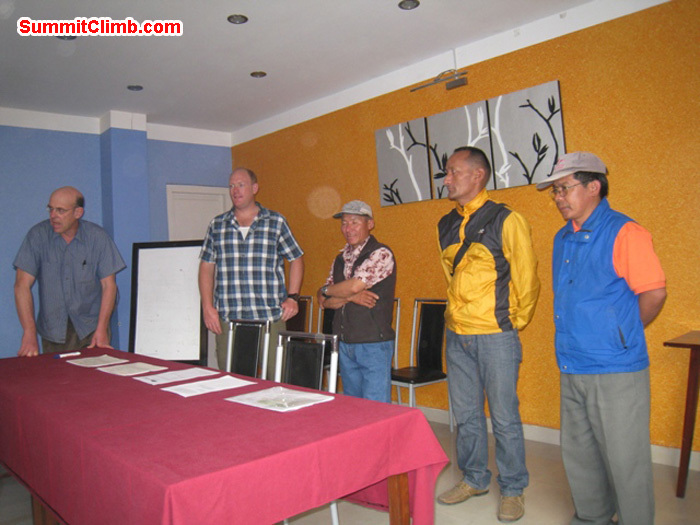 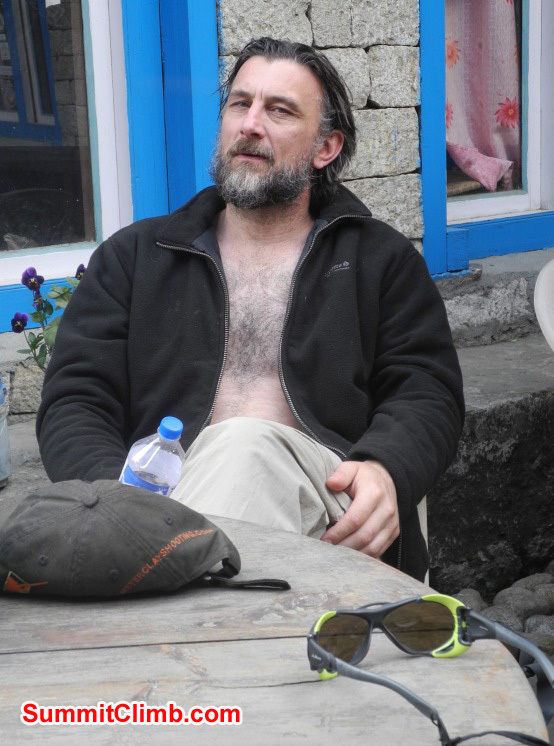 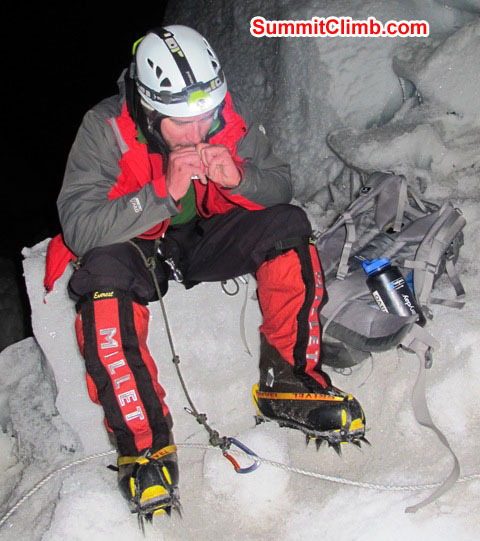 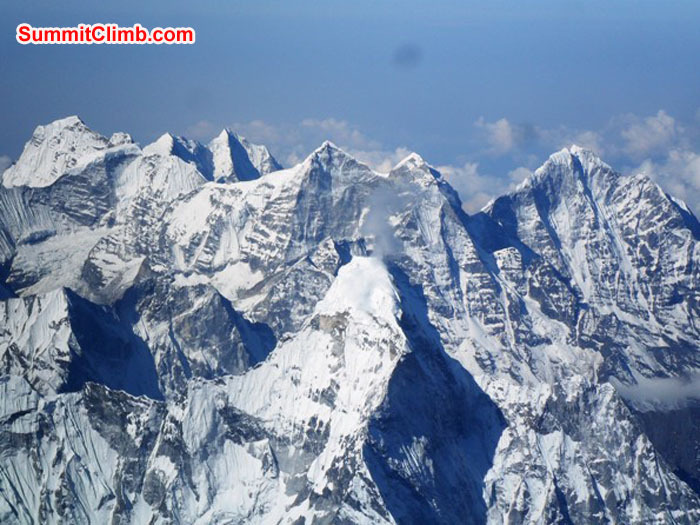 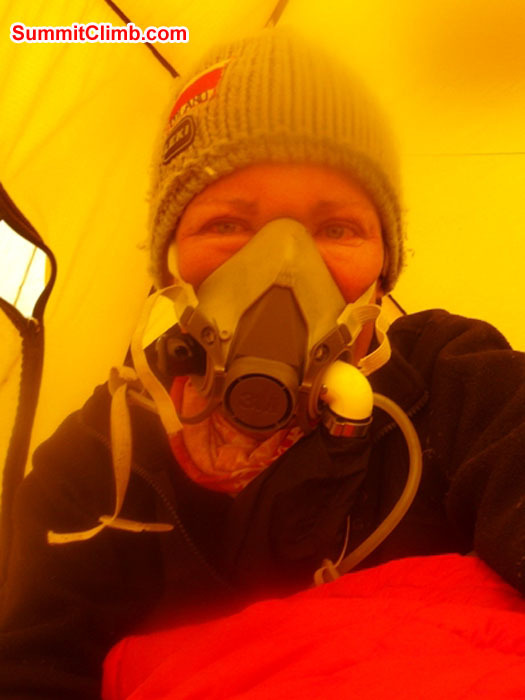 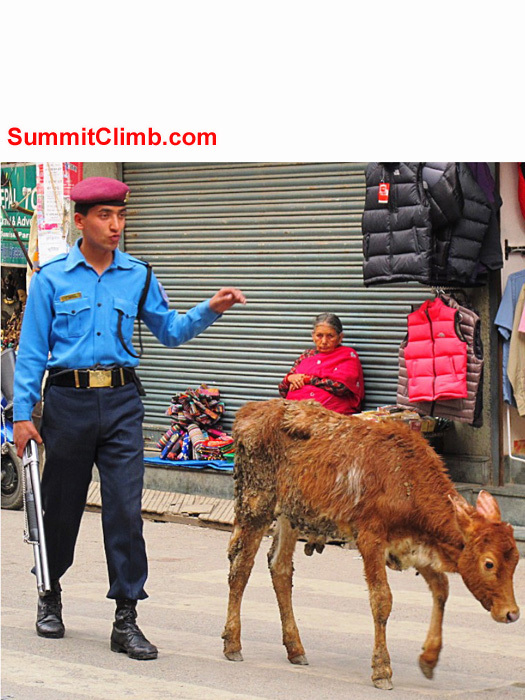 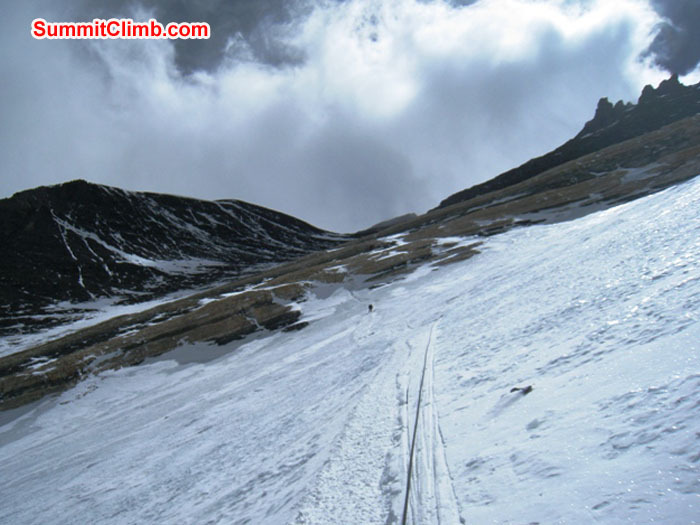 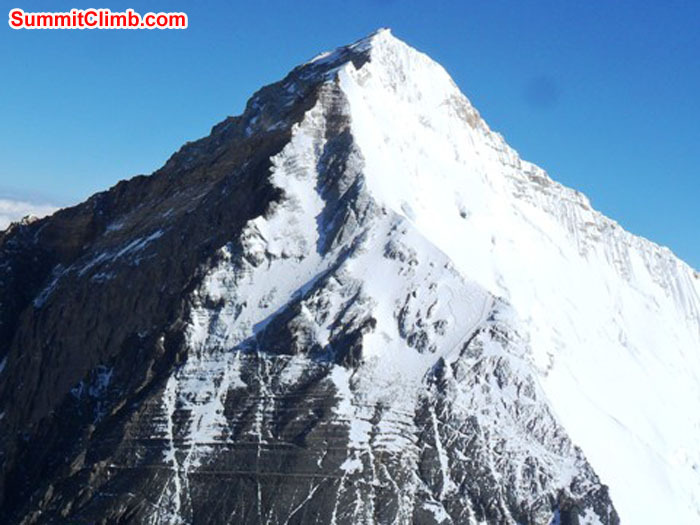 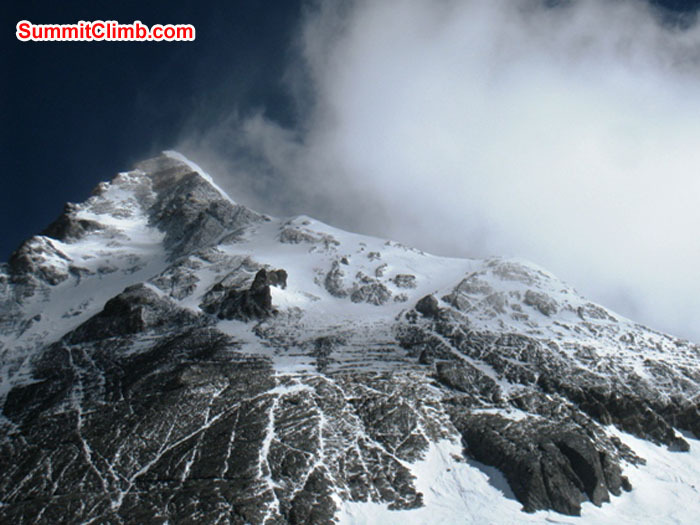 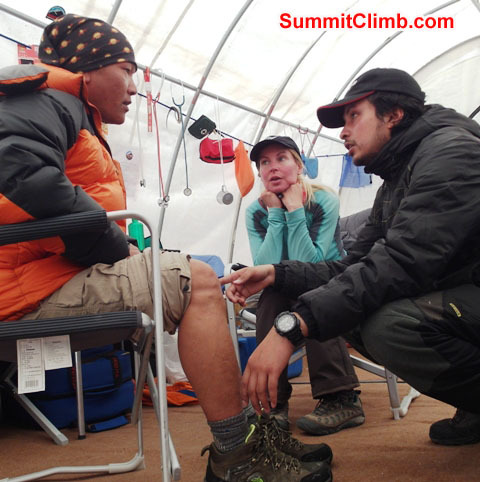 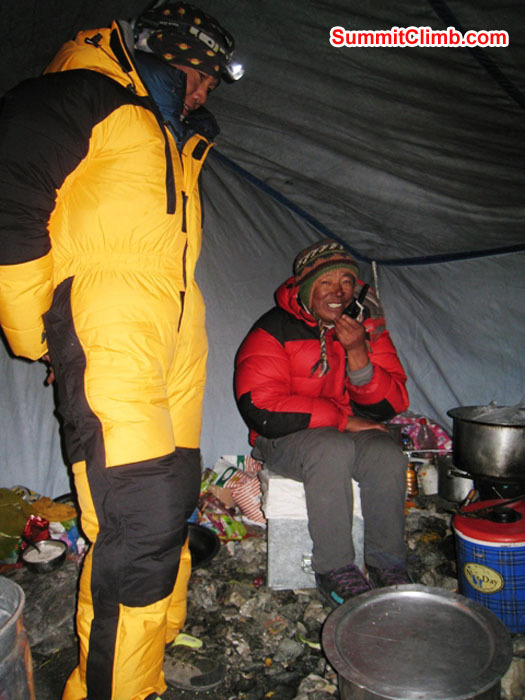 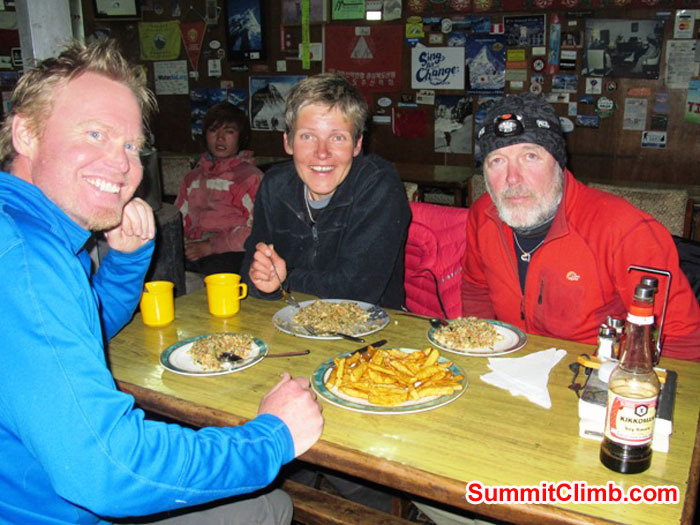 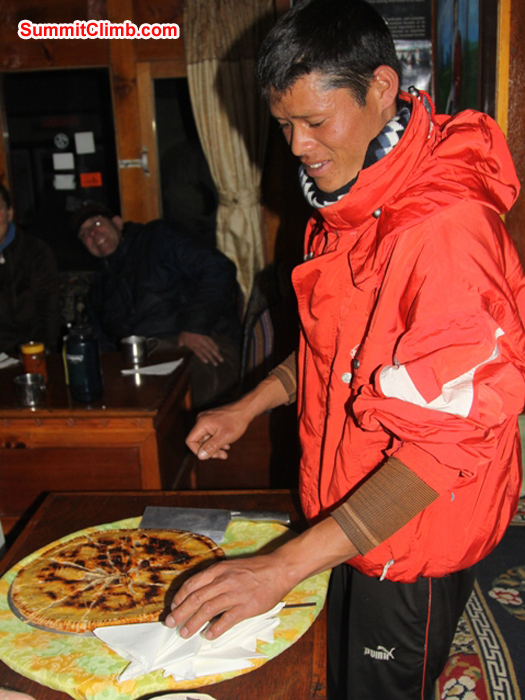 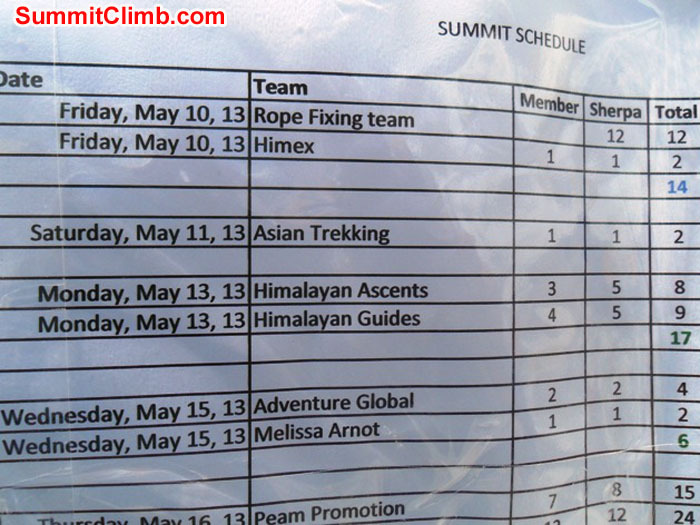 Nepal Everest - Lhotse Dispatch 21 April : Team makes acclimatization walk to 5650 metres / 18,500 feet.